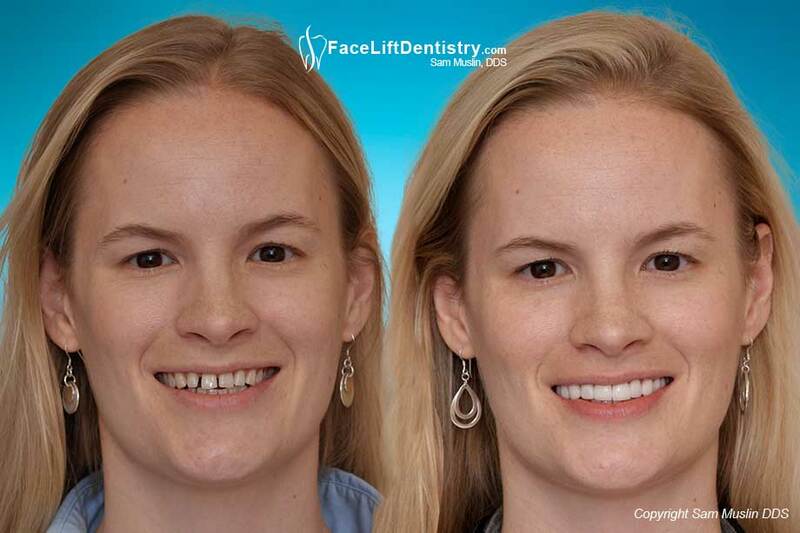 Patients with small teeth usually have a small smiles and may experience facial collapse early in life. 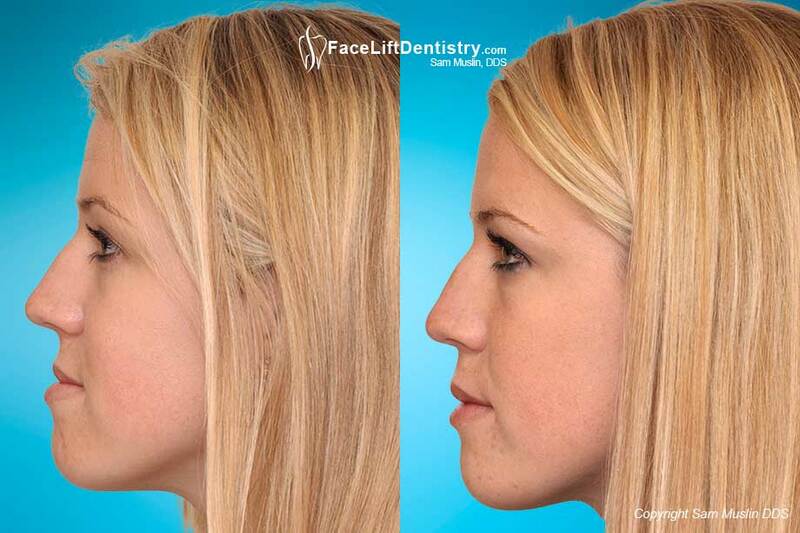 The small chin only appears to be small because the chin is pushed back and closes too far. A misaligned jaw and bad bite will affect on your facial profile. 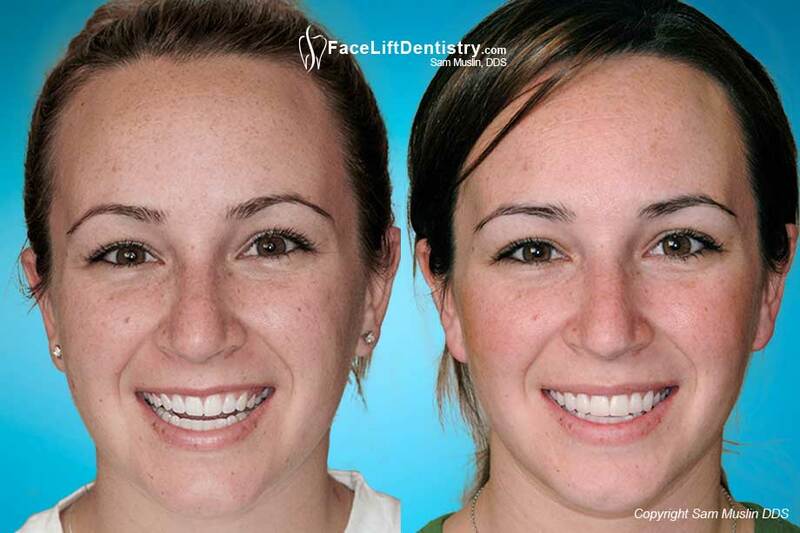 Jaw alignment and bite correction are possible without surgery or grinding down healthy tooth enamel. Overbites make Chins Look Small. Coming soon - please check back. The optimum way to address overbite problems is with non-invasive VENLAY®Bite Restoration. 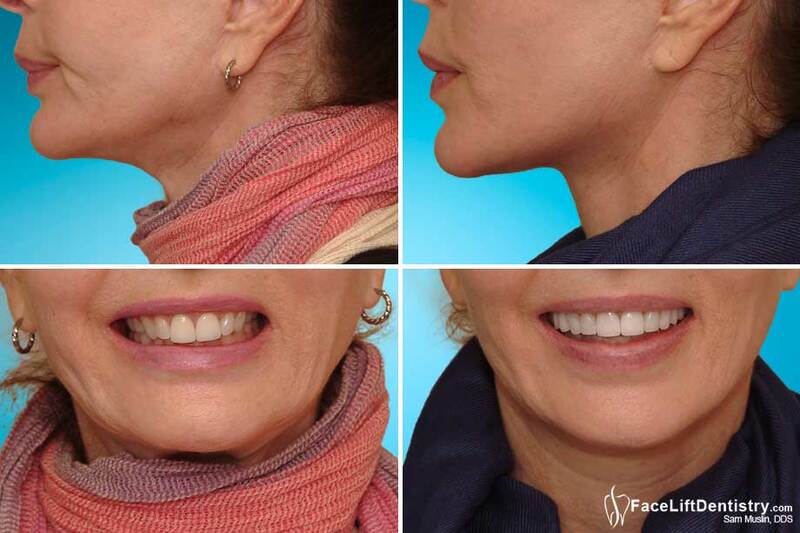 Porcelain veneers can only camouflage the overbite, and in so doing, aggrevate the problem. 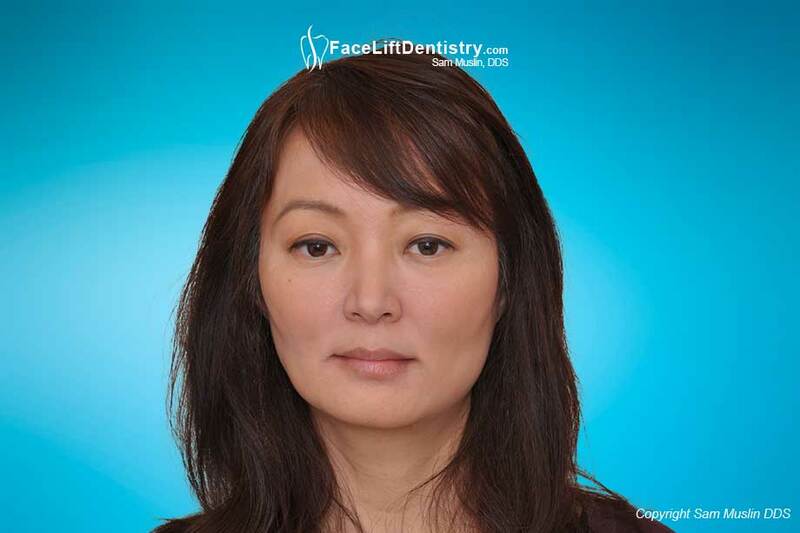 Jaw and crown pain after being treated by her local dentist. When your teeth are ground down, there are a multitude of problems that can arise over the lifetime of the patient. The first level of care was to get her jaw in a comfortable position and close the open bite down so she could speak clearly and get pain relief. 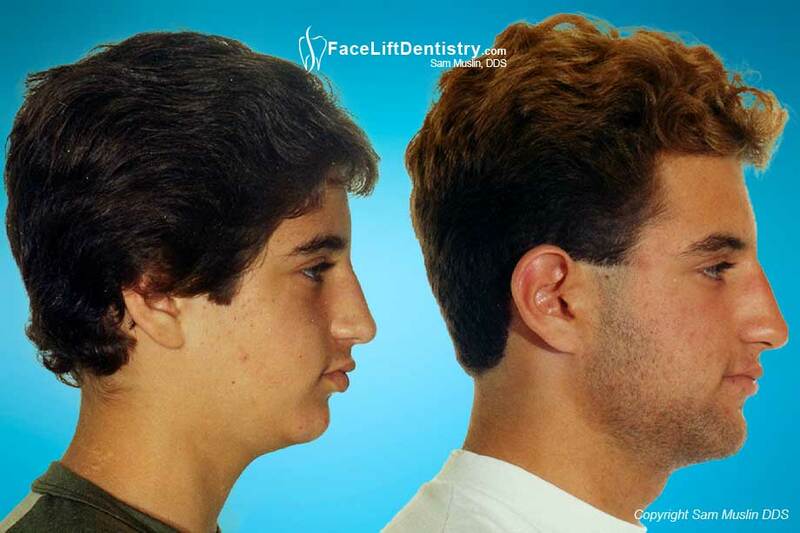 We can live our lives with the wrong bite and jaw position, or we can optimize our health and our appearance by having your jaw aligned and bite corrected. 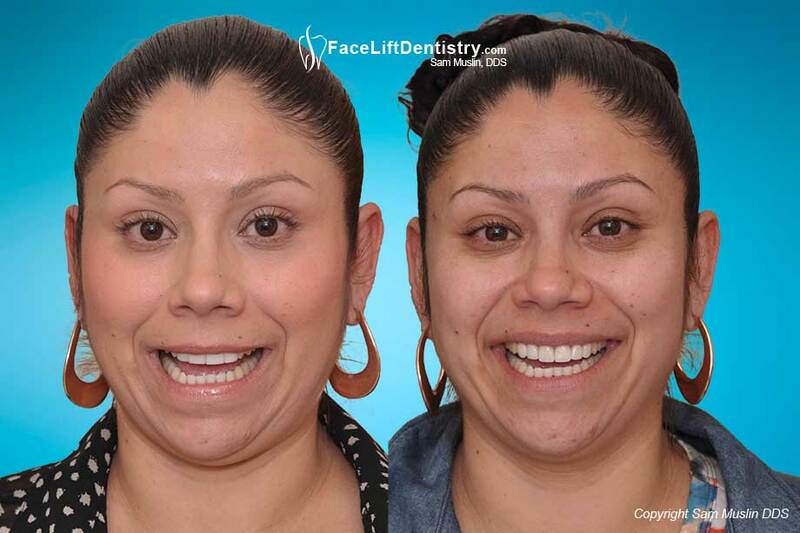 This patient's open bite was corrected without jaw surgery and without braces or Invisalign® by using JawTrac® to establish the ideal jaw alignment position and VENLAY® to correct her anterior open bite. 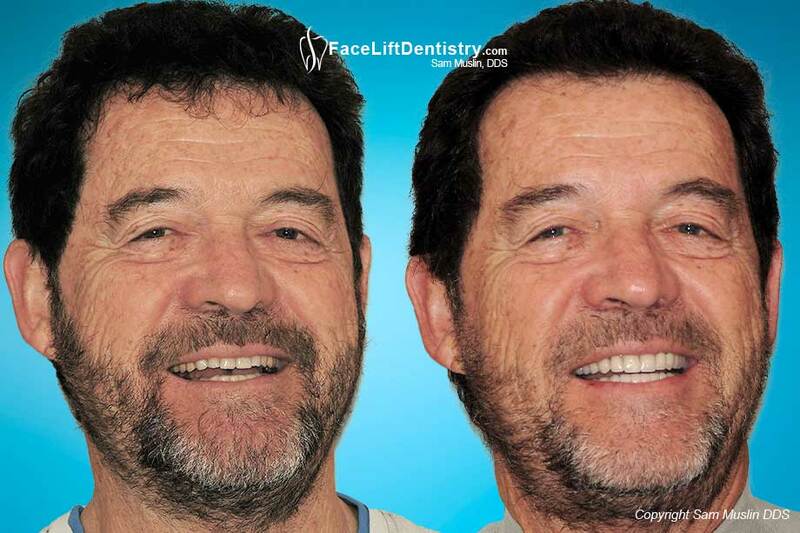 Medical professionals often overlook the best solution to correct a weak chin and overbite - Overbite Correction with VENLAY® Restorations. 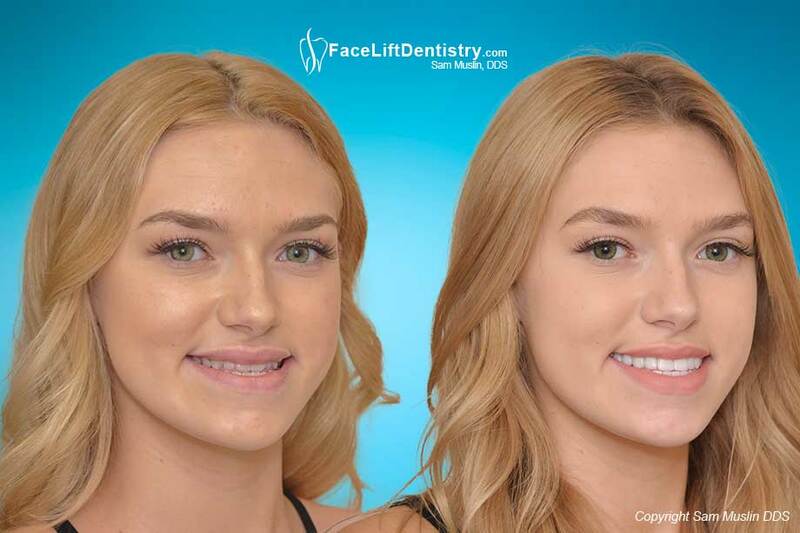 A weak chin and overbite corrected without surgery or braces in just a few weeks. An underbite is bad for you and can lead to facial abnormalities and health problems. 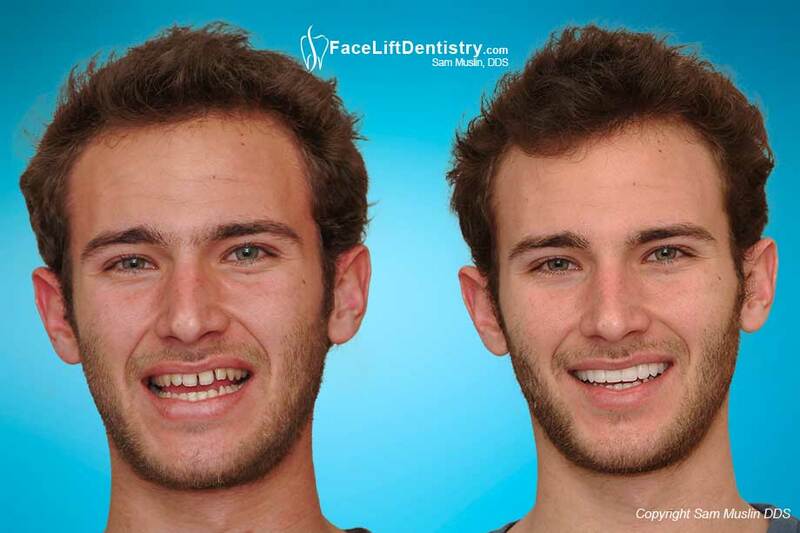 Learn how you can have your underbite corrected without jaw surgery and braces in just a few weeks. 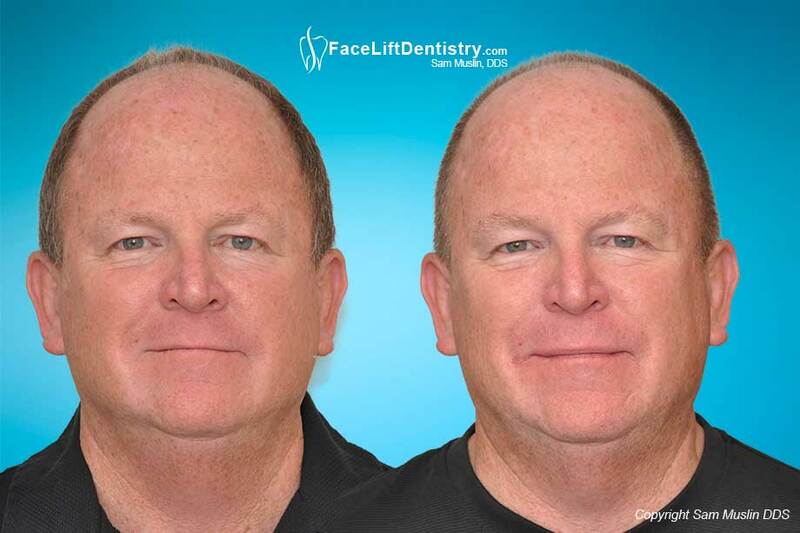 A non-surgical alternative method to address his protrusive chin and underbite gave this patient a physical makeover and confidence boost with his new smile, comfortable TMJ, and markedly better profile. 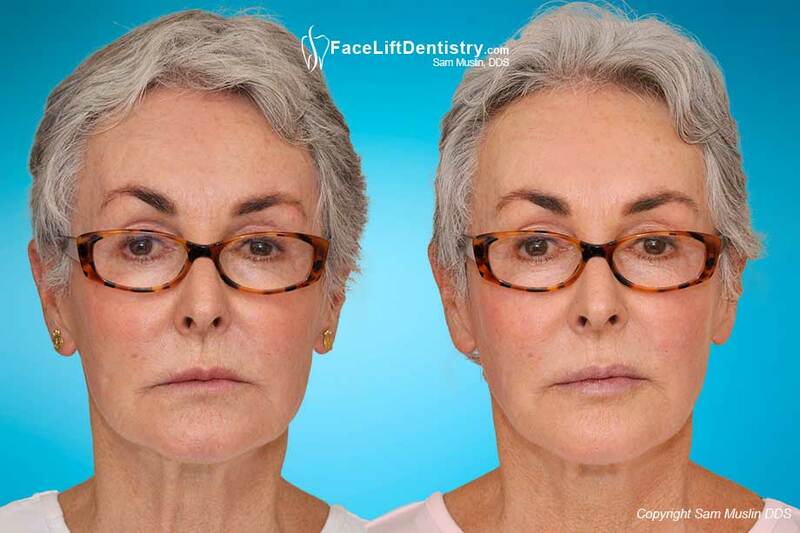 Today, there is an age defying facelift alternative that actually lasts longer than a facelift and has health benefits that improves the shape of your face and the quality of your life. 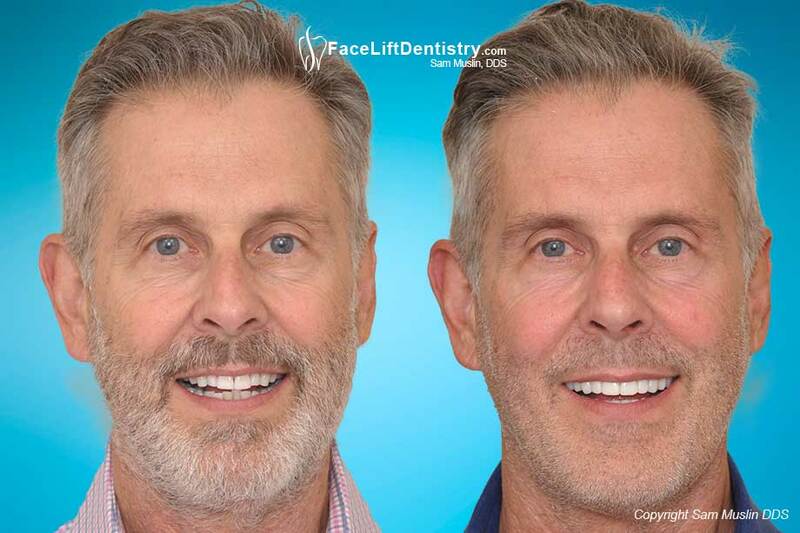 Adult underbite correction completed in less than 3 weeks without any surgery nor the need for Invisalign® or braces with the Face Lift Dentistry® method, VENLAY® restorations and JawTrac® jaw alignment. Patients with uneven bites have a misalignment with the TMJ or temporomandibular joints. Uneven bites cause the patient to look older and feel older. 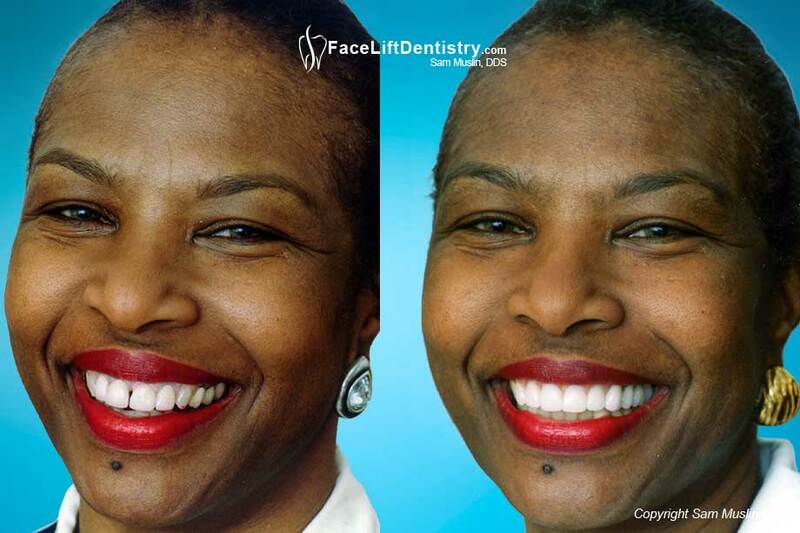 Many seniors can't see their upper teeth when they talk or smile as they are worn down. 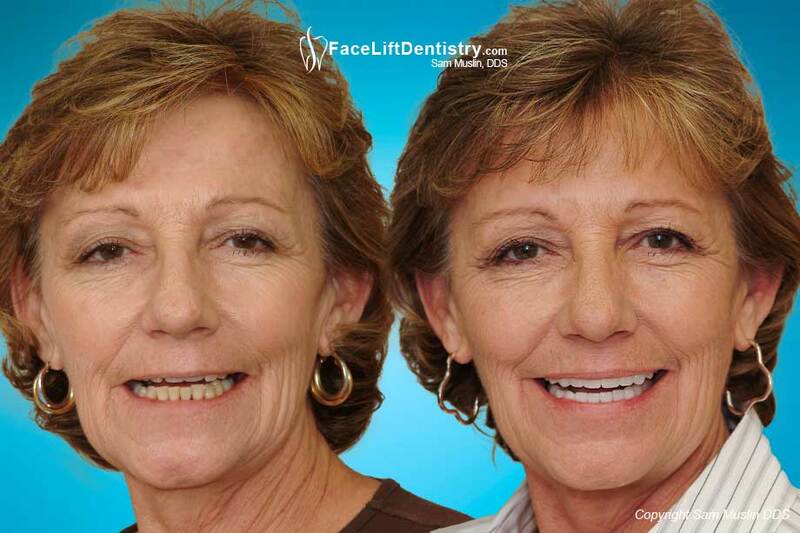 Learn what anti-aging Face Lift Dentistry® and VENLAY® Restorations can do for you. Almost painless and without surgery. 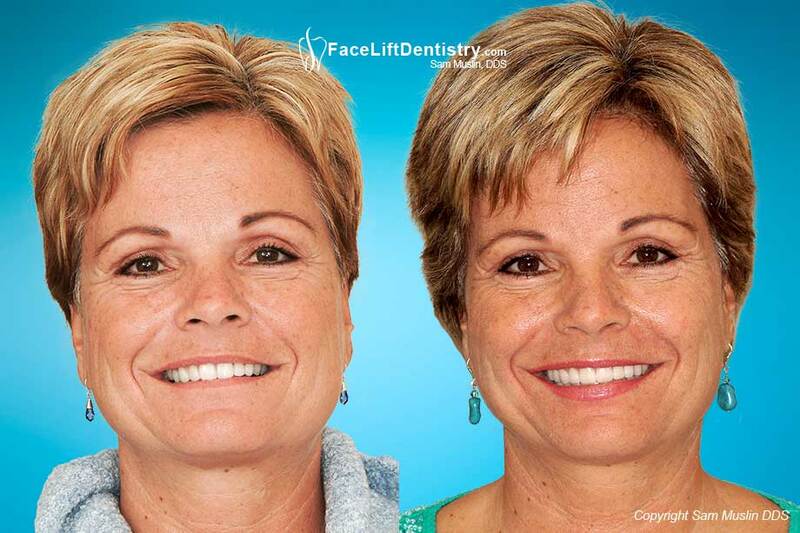 Instant pain relief with non-surgical JawTrac® bite correction, VENLAY® restorations and the Face Lift Dentistry® method. When our bites get worn down, our soft tissue bunches up on the sides of our mouths because the soft tissue has lost support from an ideal jaw position. 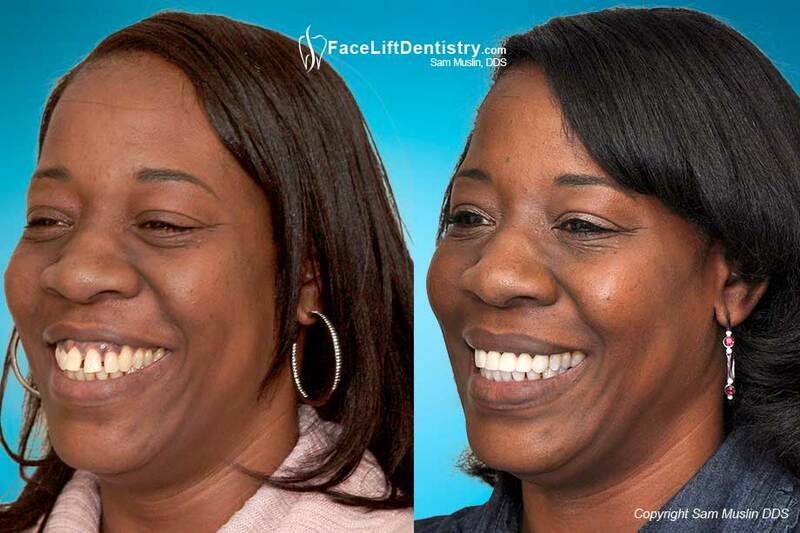 JawTrac® jaw alignment with VENLAY® restorations and the Face Lift Dentistry® method offers the ultimate solution for bite collapse. None of his back teeth touched. He could not chew or speak normally and his teeth were afflicted by Amelogenesis Imperfecta which complicated his bite correction treatment. 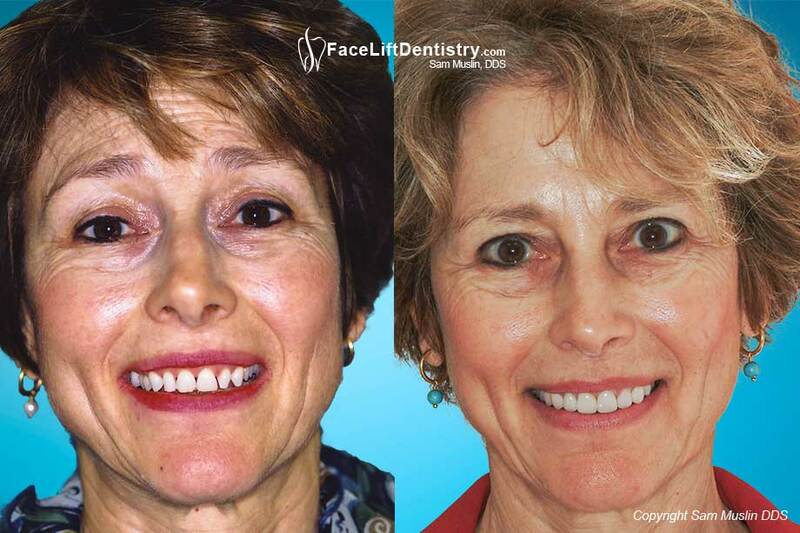 Underbite correction is possible for most patients by locating a healthy jaw position that improves the shape of the patients face and profile. 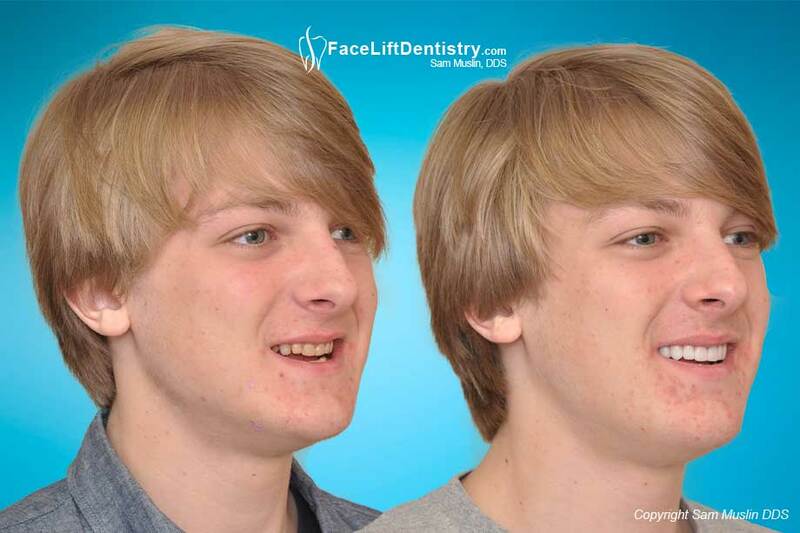 Locating the best jaw position for the patient is now more predictable than ever using JawTrac® that allows patients to experience an immediate improvement in the size of their chin. 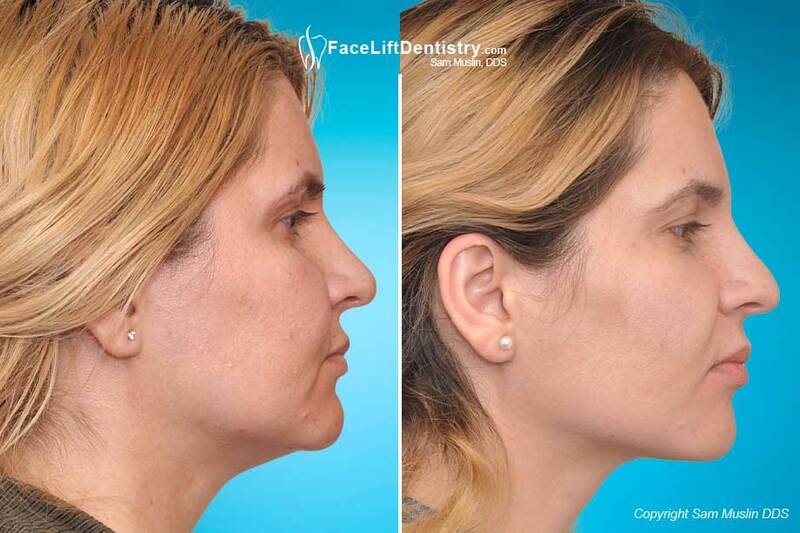 When a patient has the wrong jaw position their face and profile are compromised. 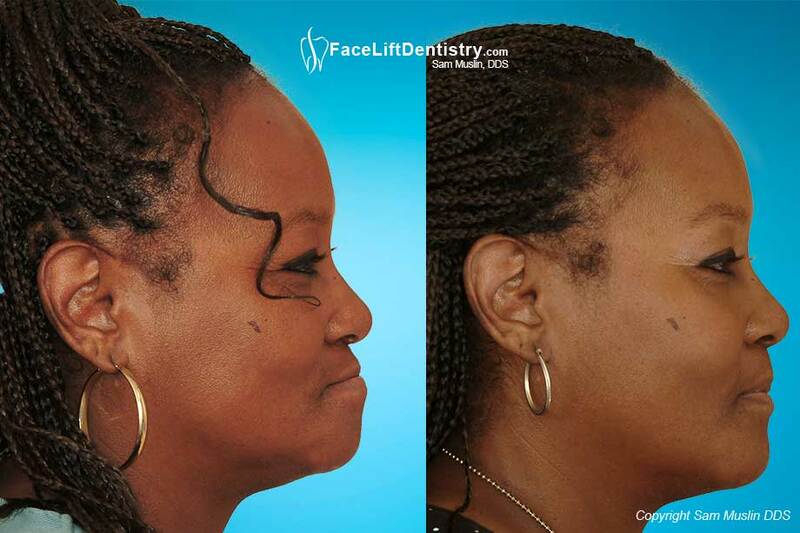 This patient struggled with daily headaches because her bite forced her jaw to function in an unnatural position. 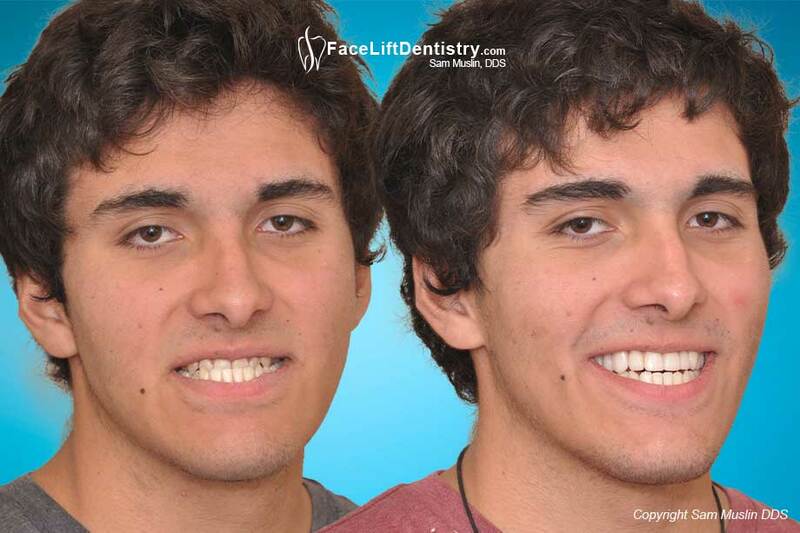 The treatment for this patient was to improve his health by locating the healthiest jaw position considering that he has an overbite. He was willing to fly to California to have it done. 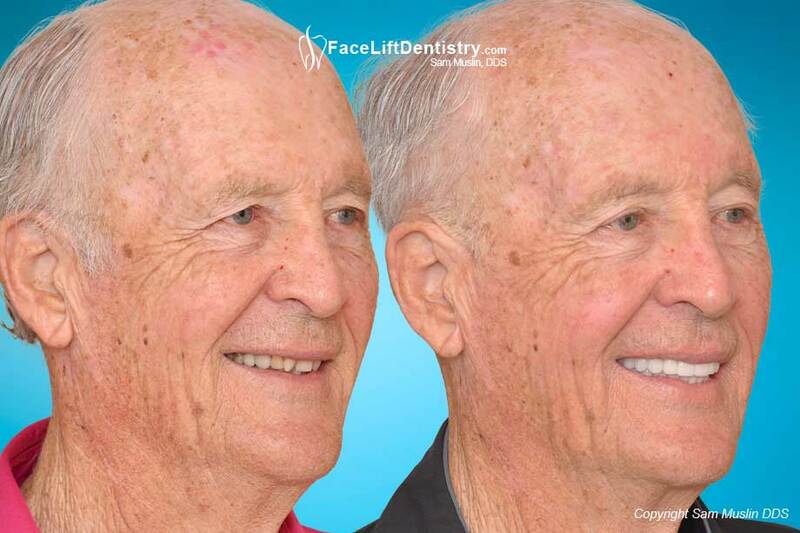 When a patient ages prematurely because of the shape of their face and has a small looking chin with facial wrinkles, they are experiencing bite collapse. 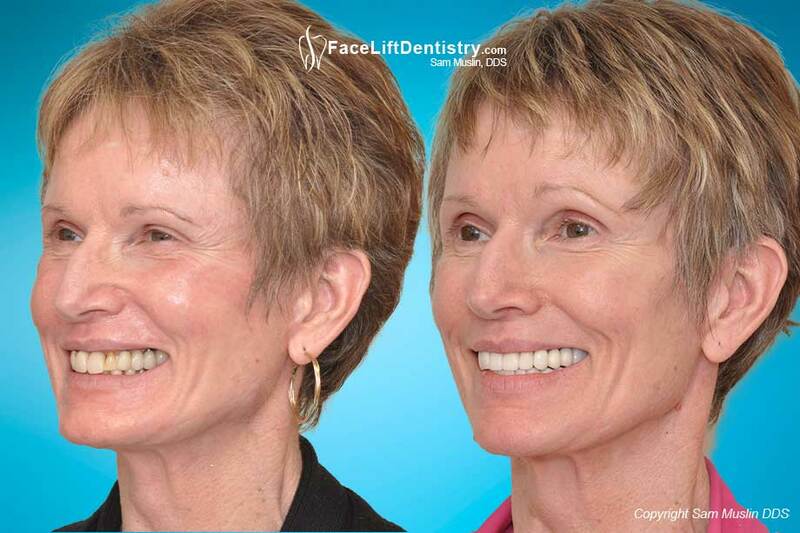 Bite correction is the key to improving the shape of the patient’s face and reverse premature aging. 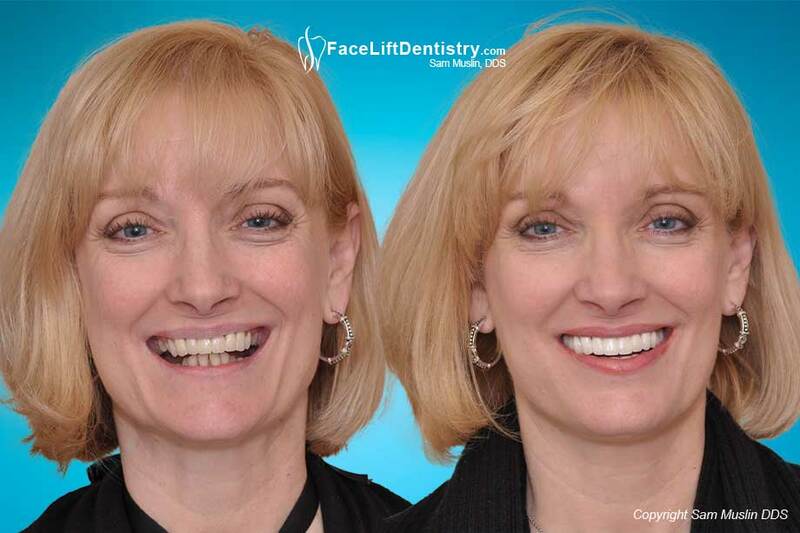 Most anti-aging dentistry is just cosmetic dentistry but in this office the entire face benefits by obtaining the optimal jaw position during this “patent pending” non-surgical bite correction method. 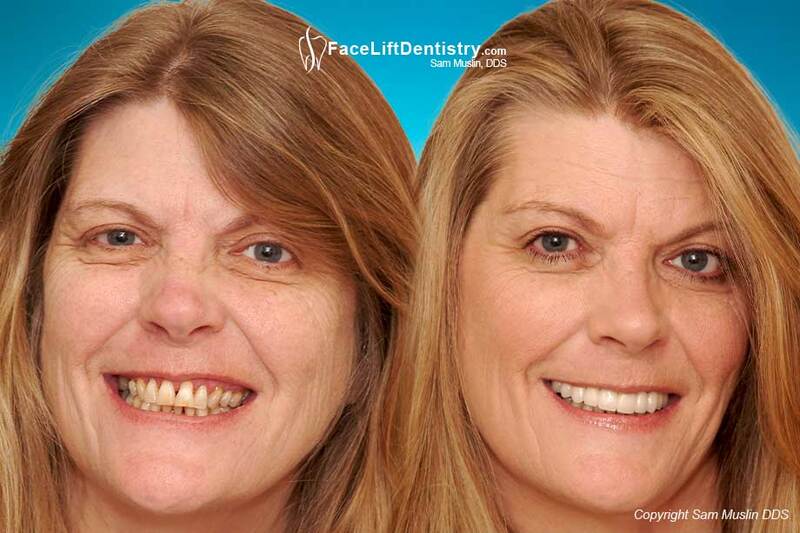 A collapsing bite with teeth spreading apart required Face Lift Dentistry ®. 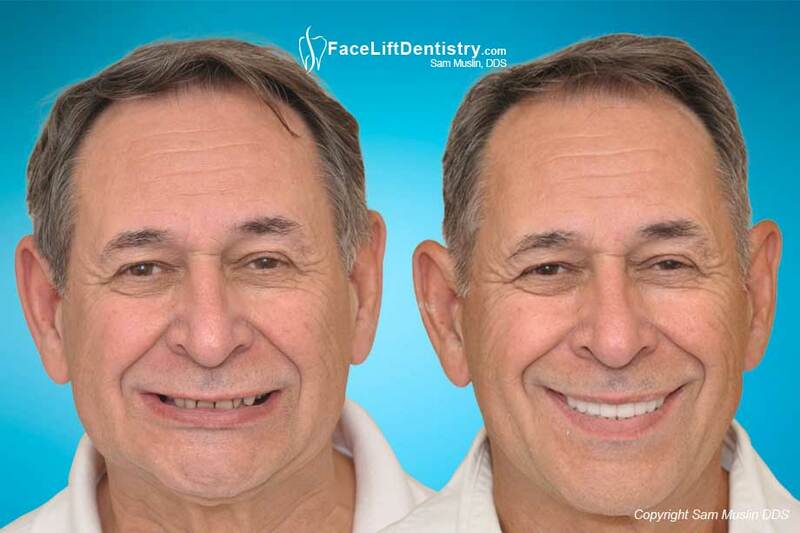 Dental implants, porcelain crowns, Procera crowns and a fixThe shape of your face is directly determined by the bite and jaw position. 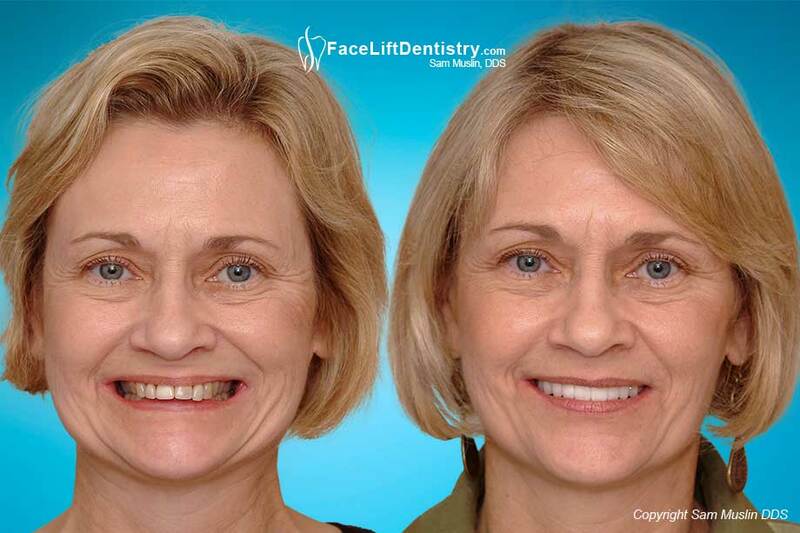 With this treatment, patients look younger and feel younger when the tension, stress and premature aging are reversed. 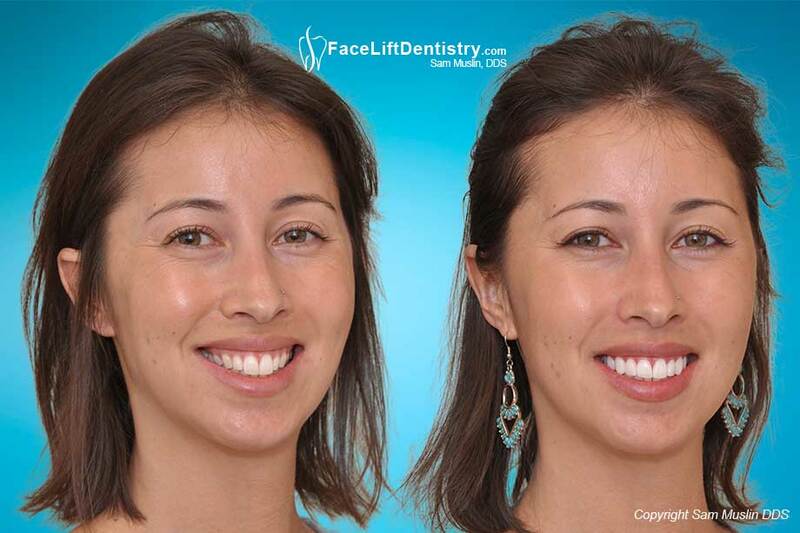 True beauty starts with the shape of your face and facial profile, which brings out the patients natural beauty by aligning the bite to coordinate with the TMJ and her facial structures. A new approach to Open Bite Treatment, non-invasive and no need to shave down healthy teeth. No surgery and no braces, treatment completed in 3 weeks. 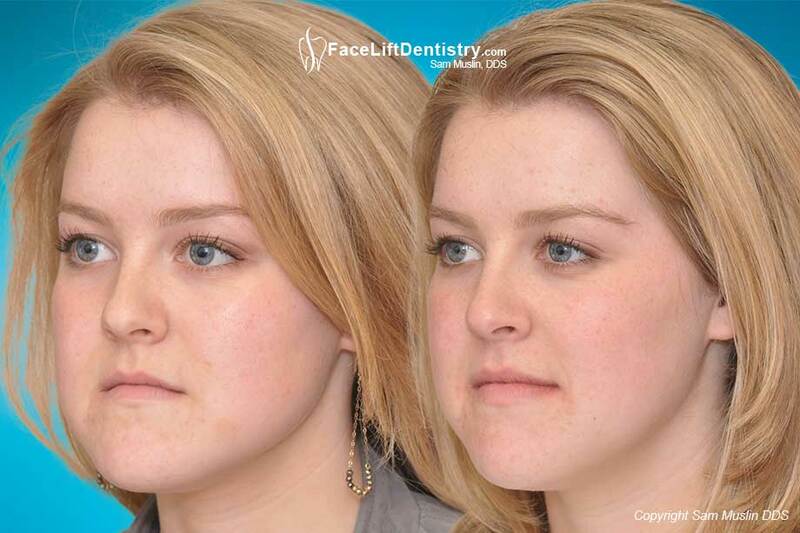 She was told that in order to correct the open bite caused by the first jaw surgery, she would need another jaw surgery and a couple of years of braces to surgically correct her open bite. The solution came when found this website. The shapes of our faces are not idealized because most of us do not have the best bite positions for our facial structure. 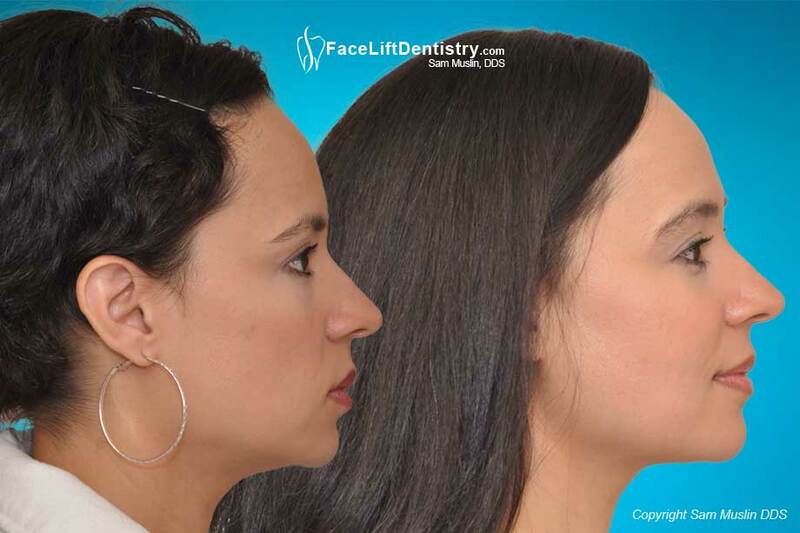 We could have a small looking chin or a short round aging face or head and neck stress all due to the wrong bite position. 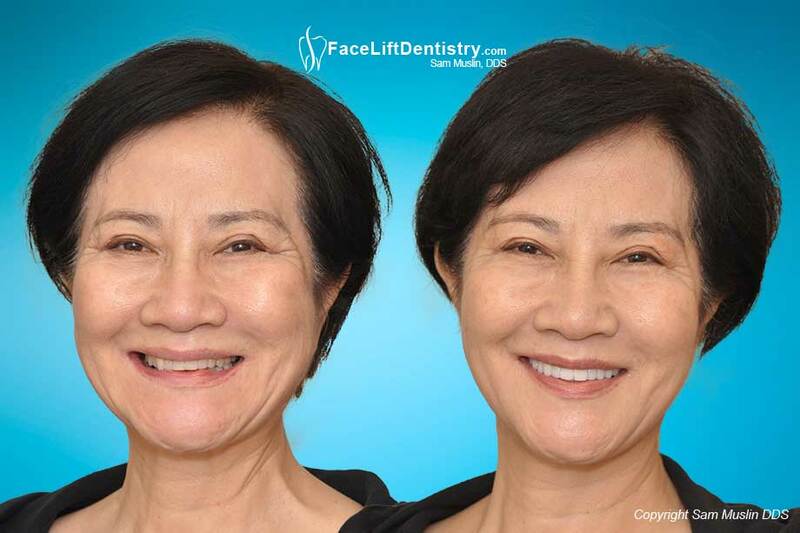 TMJ pain, difficulty chewing, headaches, jaw pain, neck pain, uncomfortable jaw position, old-lady look, non-invasive bite correction, anti-aging treatment, dental health. When a patient has an overbite, they usually have small chins, short round faces and weak facial profiles along with TMJ problems. 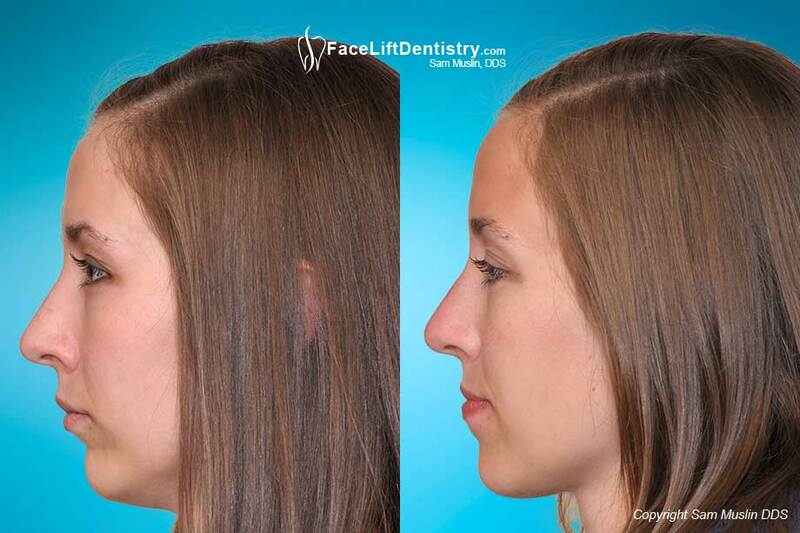 After treatment she has the facial profile she always wanted. 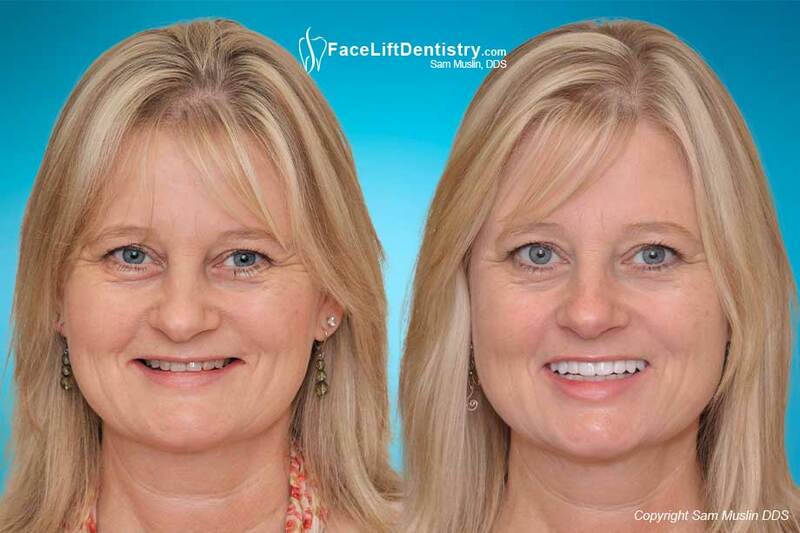 Porcelain Veneers, Years of bruxism and TMJ symptoms caused her teeth to shorten and look worn down. 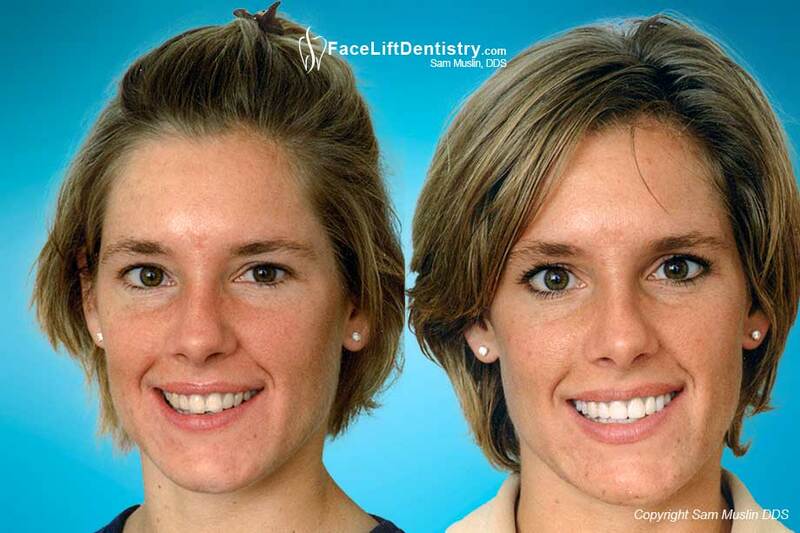 Porcelain veneers without tooth drilling gave her longer teeth and permanently whiter teeth. She no longer needs teeth whiteners. 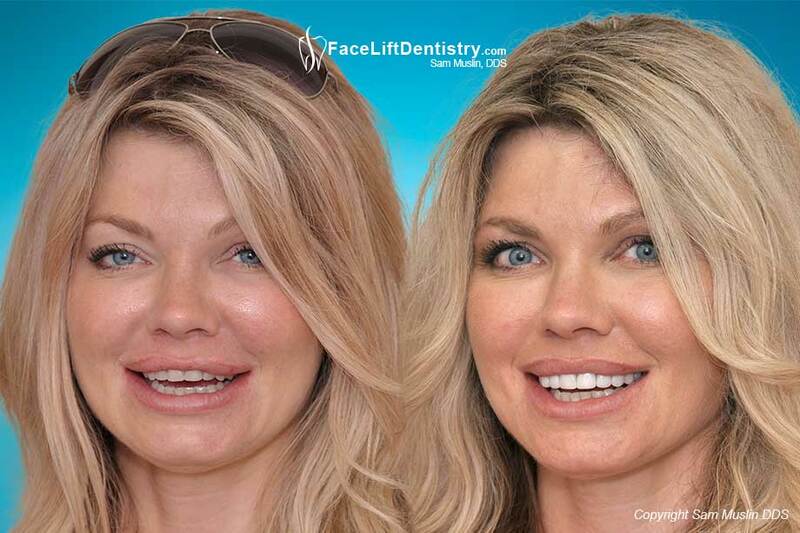 She has bad cosmetic dentistry with porcelain crowns and porcelain veneers that do not match the proportions of her face. 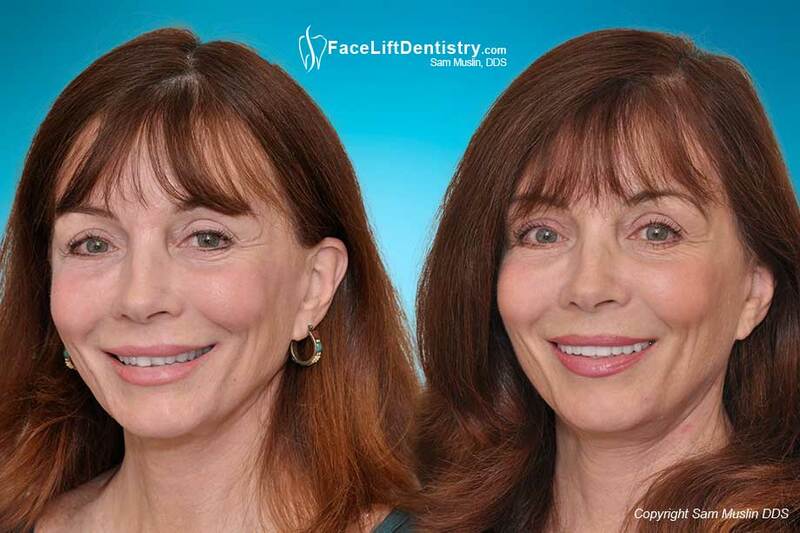 She has a narrow smile that is now wider and her face looks younger. She has a deep overbite, her front teeth are angled back and her smile is narrow. 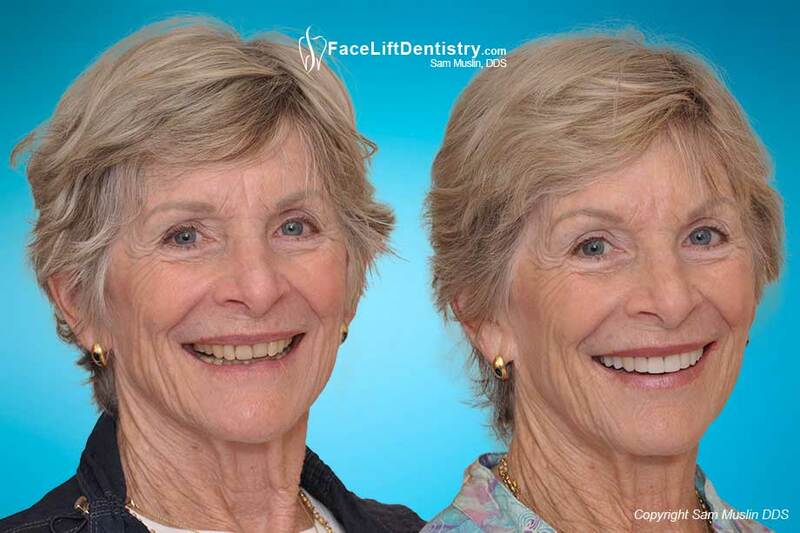 With a lifetime of old mismatched dentistry she wanted to get all of her teeth, overbite and premature aging treated simultaneously in just a matter of weeks. This patient flew from Georgia. He refuses jaw surgery and wearing braces again. 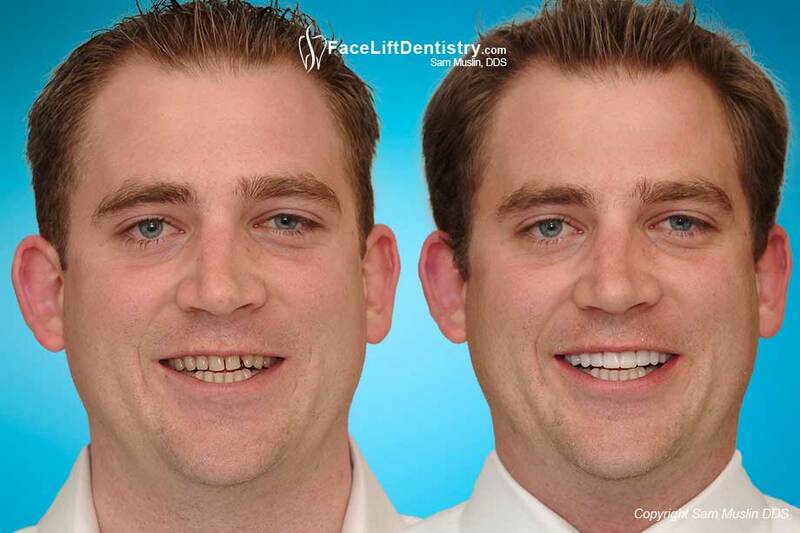 His teeth are permanently whiter; his lower jaw has a new position that makes it look smaller. No teeth were ground down. Two 3-day trips to Santa Monica. Bad Porcelain Veneers - the Dentist was my Friend! 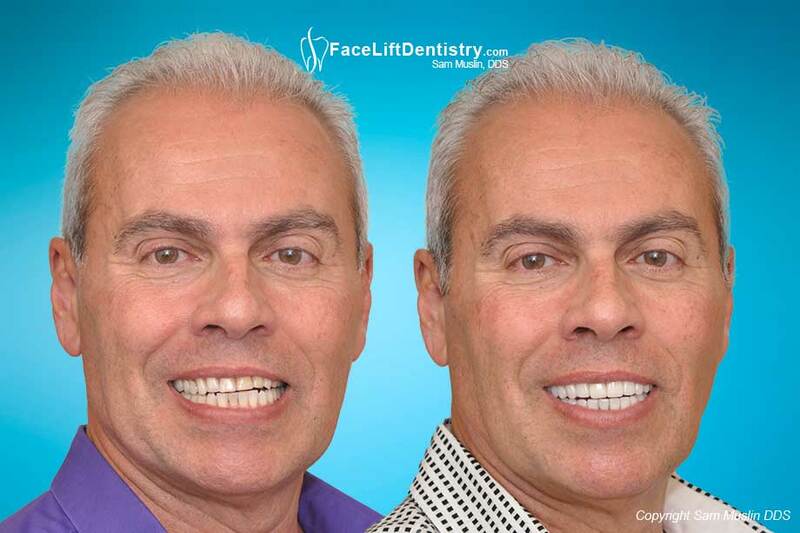 Nice friendly dentists that you respect and trust do not always have the skills to provide you with the best veneers. 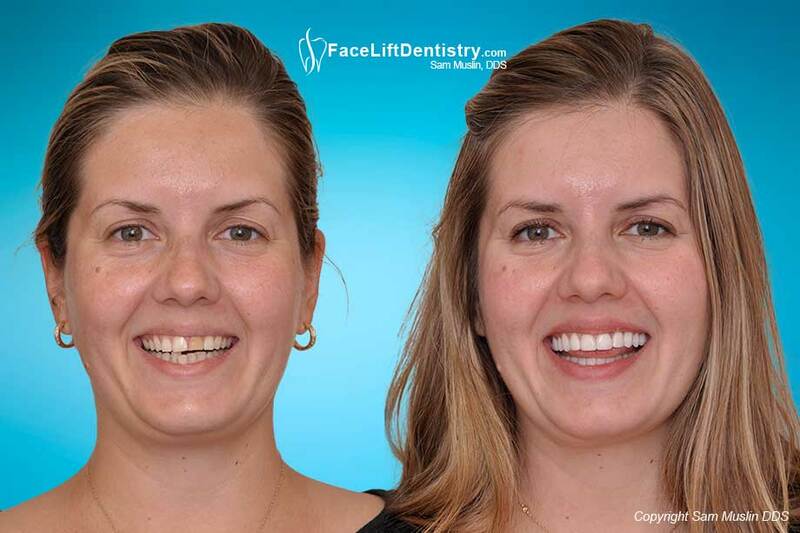 She stopped smiling after getting the veneers and her teeth were badly ground down. She says "Get it done right the first time and save a lot of anger". She flew in from Washington to by treated by Dr. Muslin without even understanding that he would exceed all of her expectations. 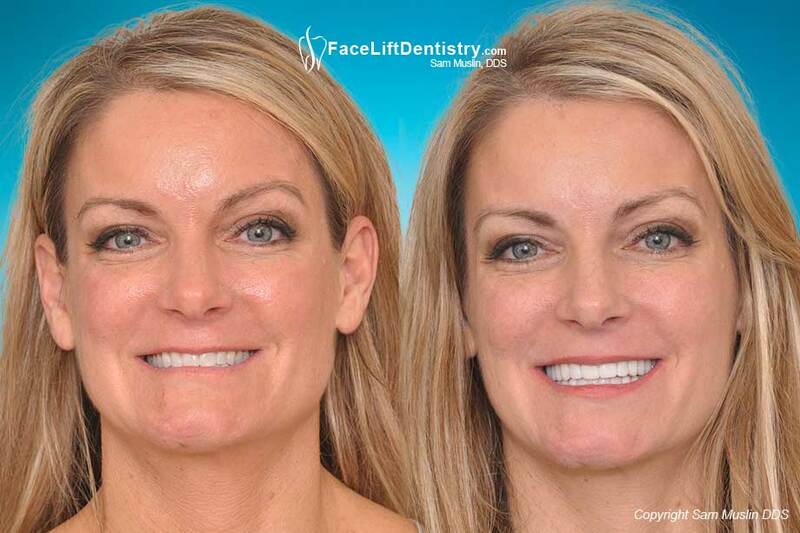 Her slanted smile and worn teeth make her look years younger with anti-aging bite correction treatment. 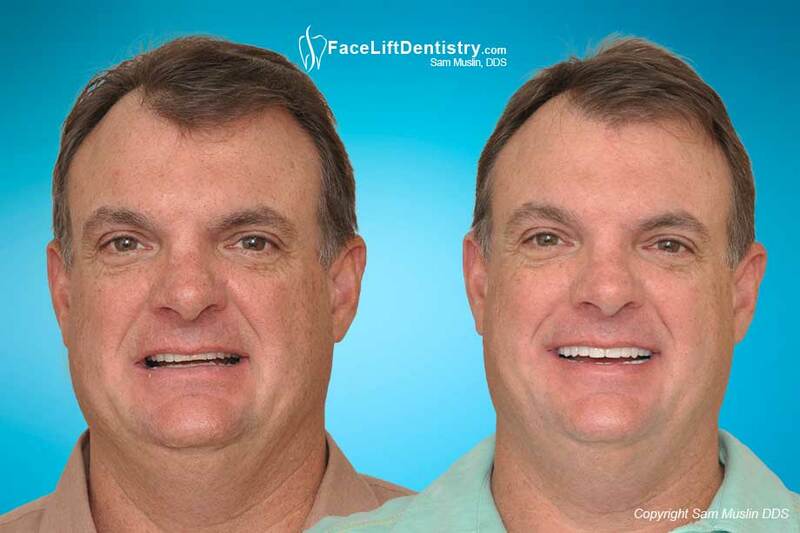 He was considering porcelain veneers but did not want his teeth to be ground down. 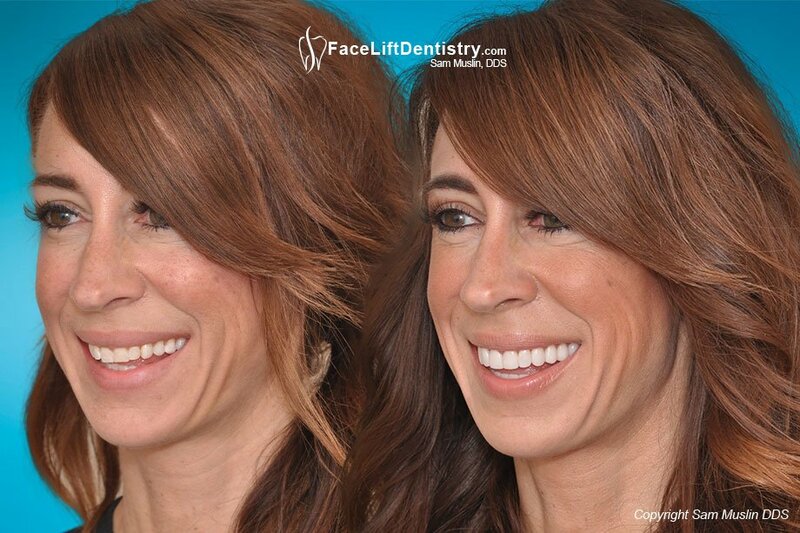 Non-invasive veneers was also not an option as most tend to make the teeth look short and bulky. 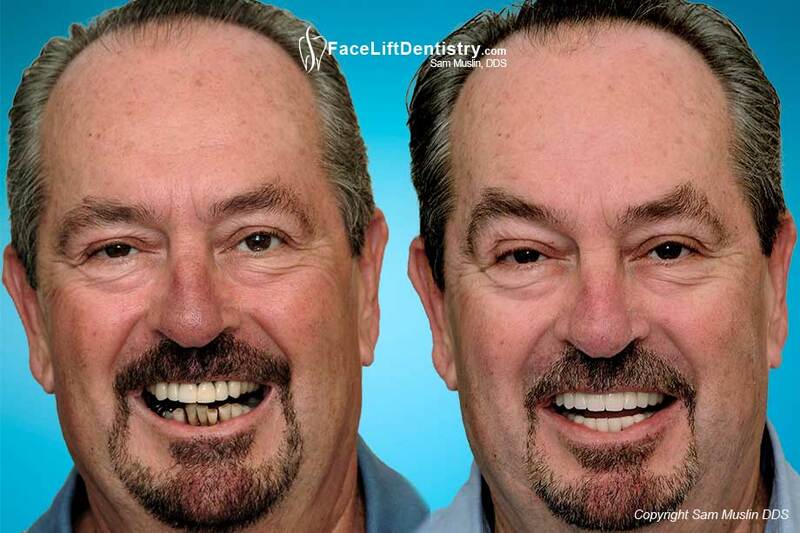 Fortunately for him he discovered VENLAY® restorations and received the added benefit of bite correction. 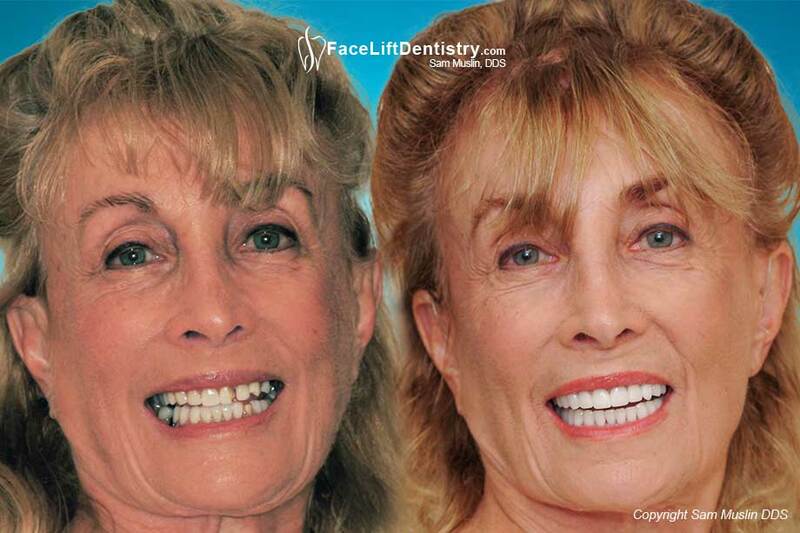 Her teeth were worn down and her face was showing signs of aging that could not be treated any other way. Her bite was correction without grinding any of her healthy teeth down. The airway is improved with bite correction dentistry allowing the patient to sleep better. 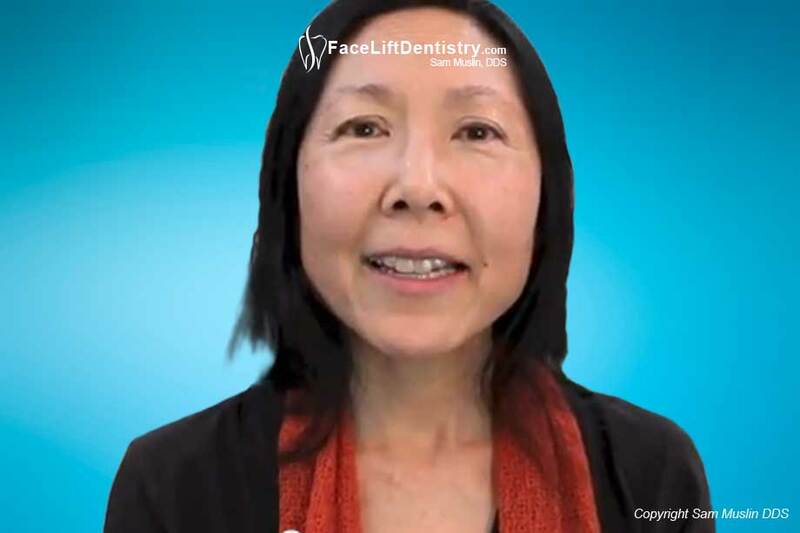 With greater chewing strength, her digestion improved and her jaw pain is gone. 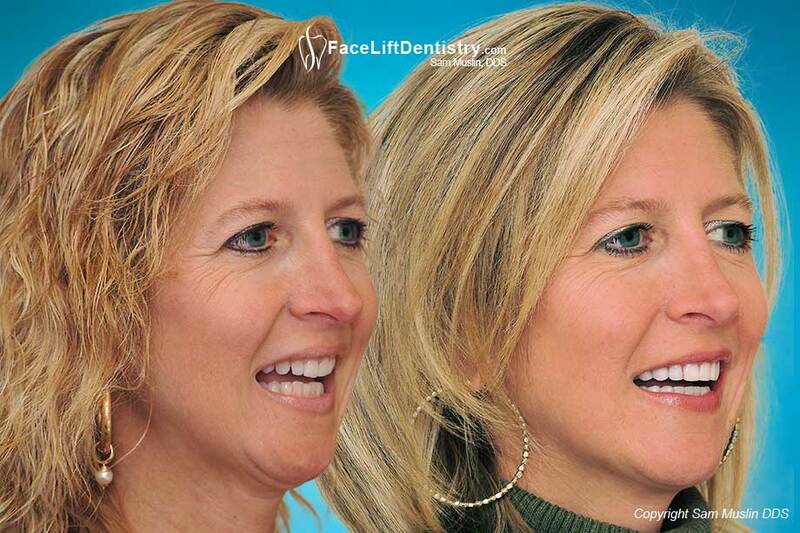 She flew in from London to get porcelain veneers to close the gaps between her teeth without grinding down her healthy teeth. 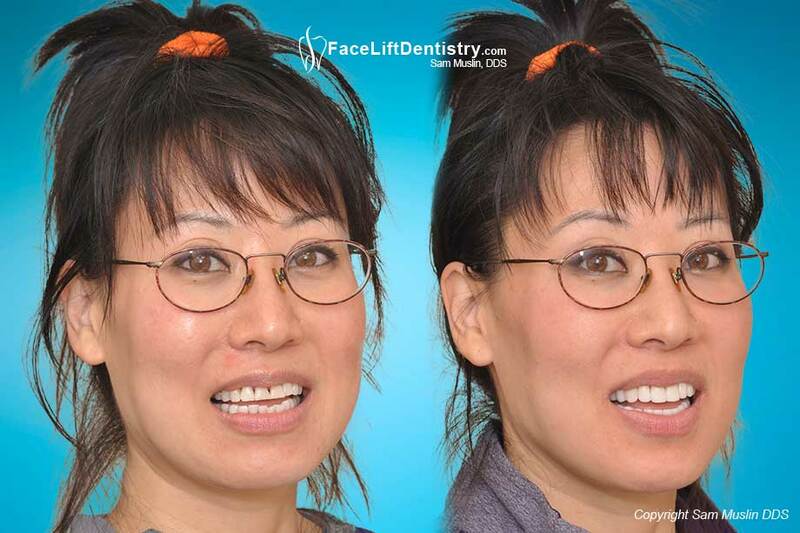 She also heard that Dr. Muslin’s veneers do not fall off and are super strong. Buckteeth and an open bite prevent the patient from speaking her words clearly. Her treatment took only a matter of weeks. 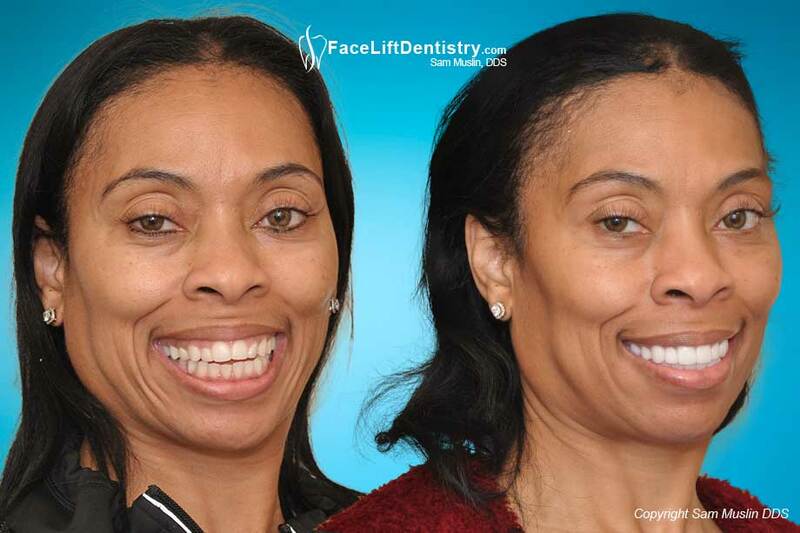 Large Front Teeth, Narrow Smile, Gummy Smile, Matching Porcelain Veneers to Natural Teeth, are the challenges that were accomplished with a solution that no other dentist could offer. 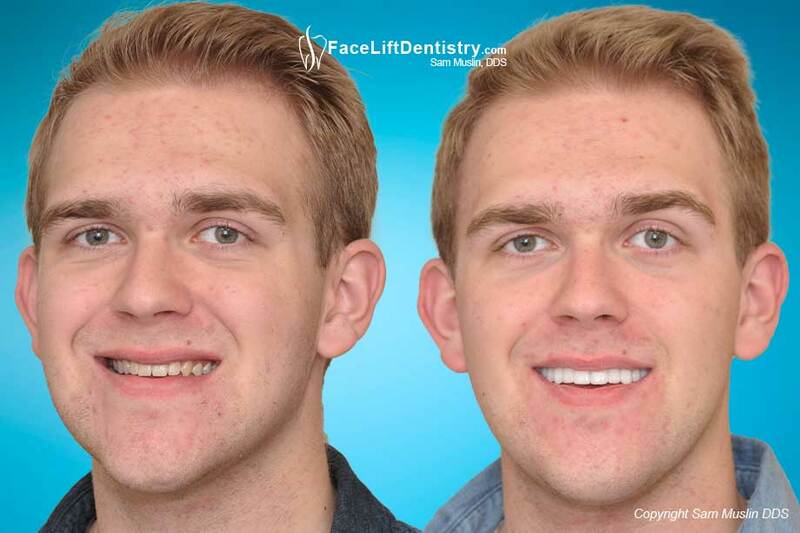 Buck Teeth Corrected - No Braces or Jaw Surgery. 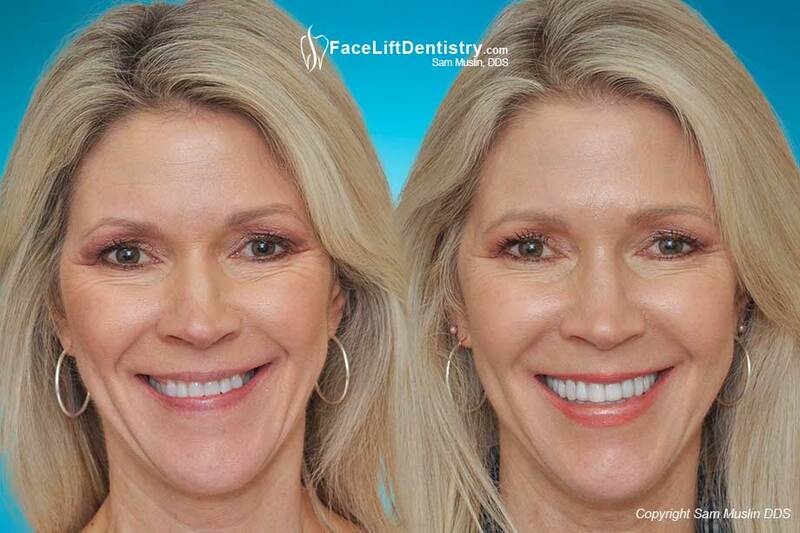 Fixing Teeth that Stick Out, Anti-Aging Dentistry, Porcelain Veneers, Crowns, Porcelain Bridge, Speech Correction, Slurred Words. 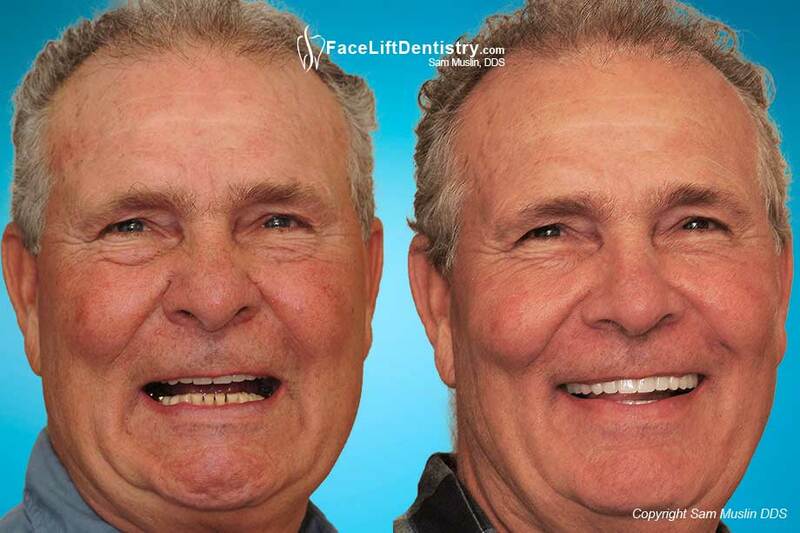 The Aging Face Reversed with Bite Correction, Bad S Sounds, missing teeth, the “old man face”, Reversing the effects of Aging, Self Confidence Booster. 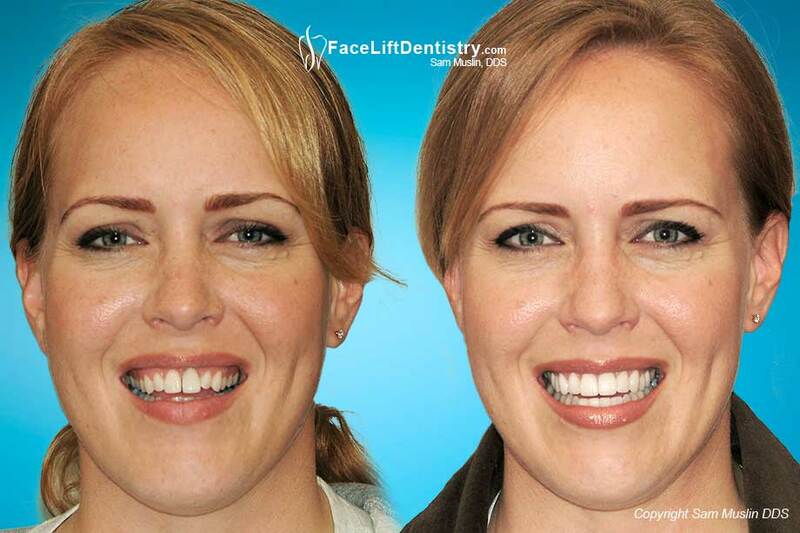 No Grinding Veneers successfully widened her smile, whitened her teeth without pain. 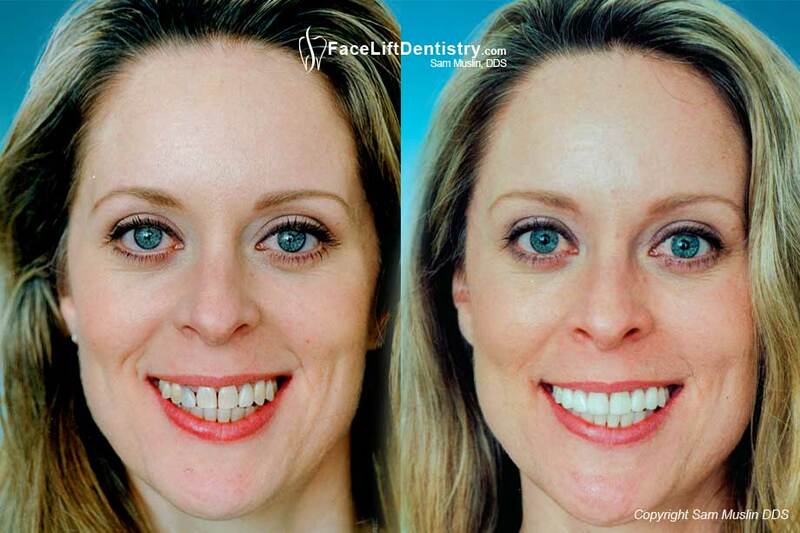 She traveled for hours to get it done because she has see too many people with bad porcelain veneers. 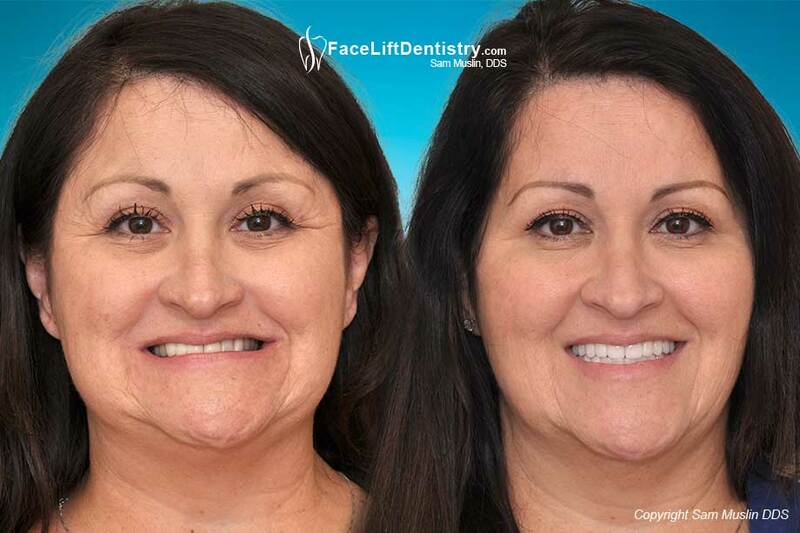 She flew in from Dallas Texas because no other dentist can offer this “patent pending” method of reversing elements of the aging face with an idealized jaw position. 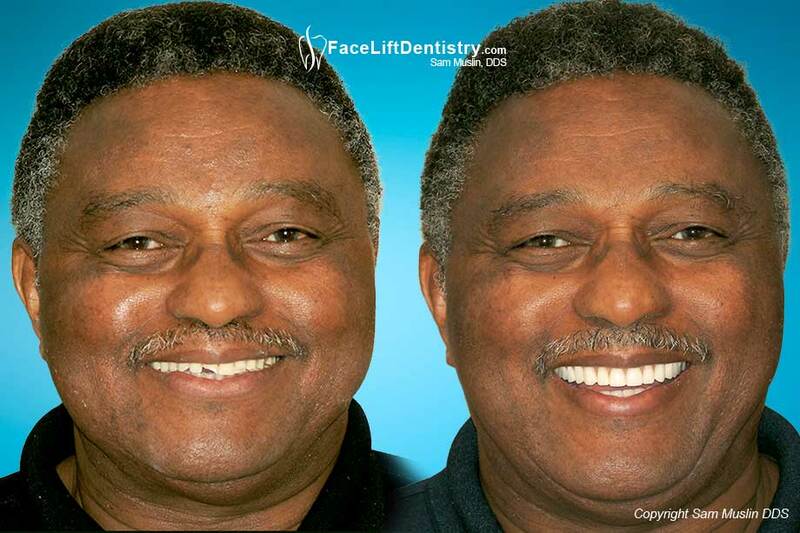 By replacing all of the old fillings and crowns at one time, this patient was able to have teeth that matched in color and size for the first time in his life. 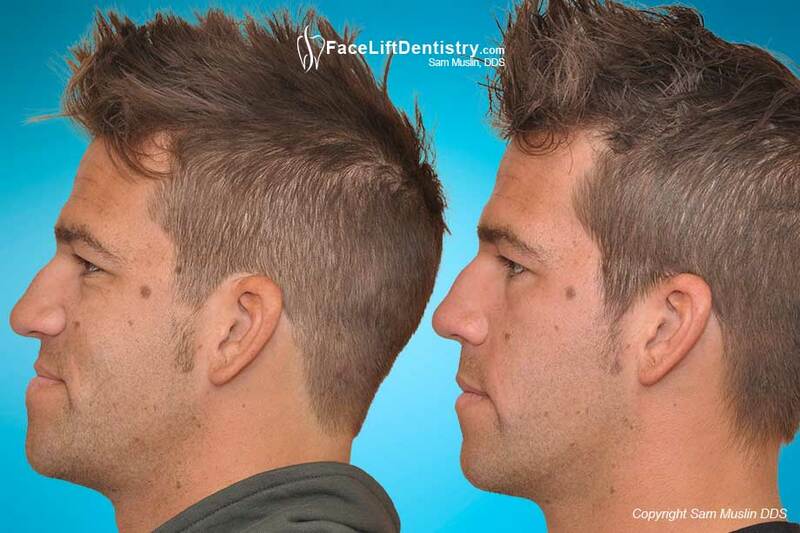 Improve your facial profile by getting your chin in the right position without jaw surgery or braces. 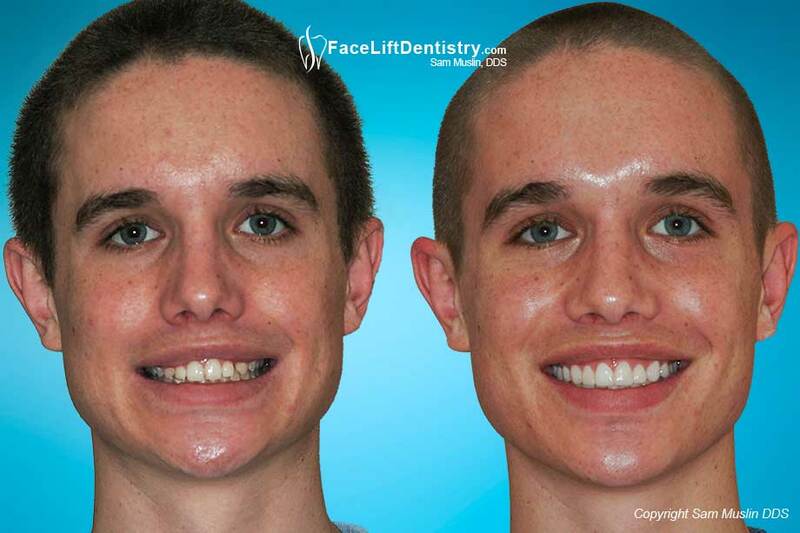 Treatment is quick and the results are remarkable. 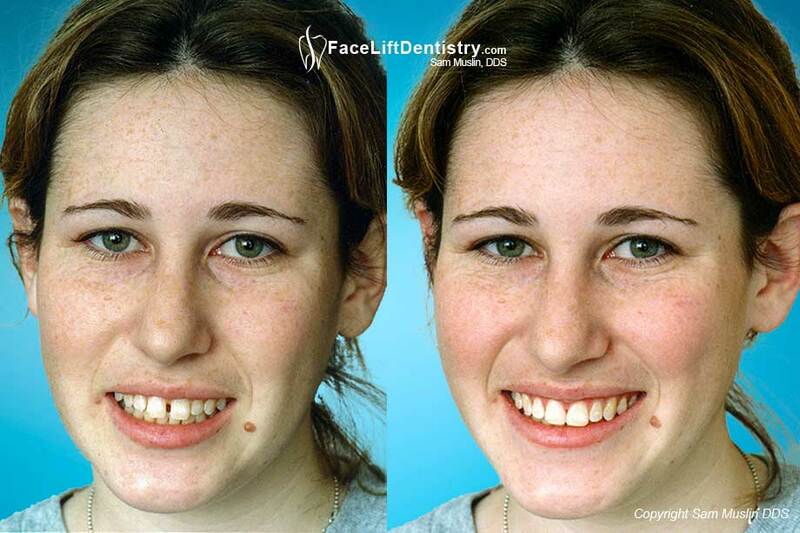 This patient had a deep overbite, crooked lower teeth and tetracycline stained teeth. 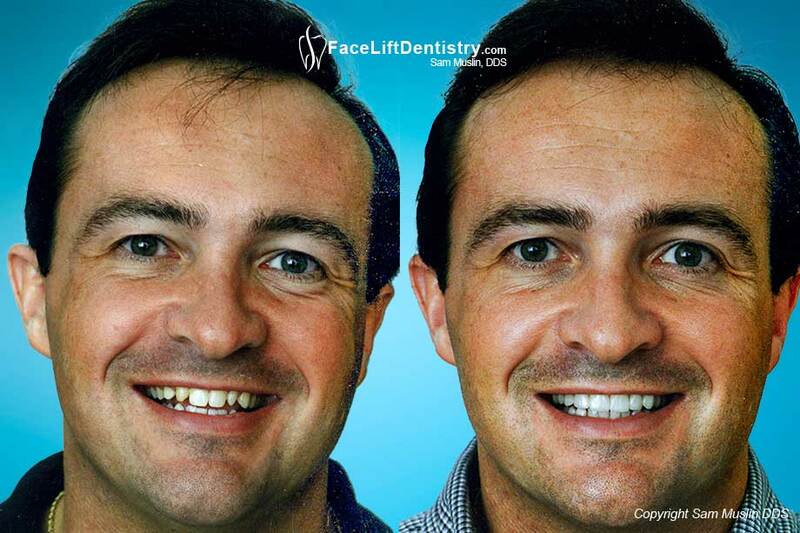 Using Dr. Sam Muslin’s exclusive VENLAY® restorations corrected his overbite and game him permanently whiter teeth. 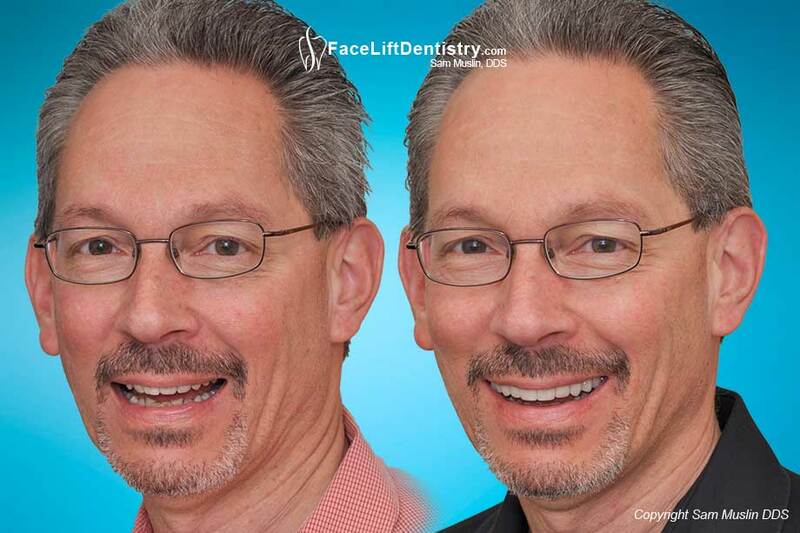 Failing dental work caused him to loose faith in dentists. He finally searched online and found Dr. Sam Muslin. His treatment was completed years ago and he has had no failures. This patient had lost jawbone form a generalized gum infection, wore down her teeth from years of teeth clenching and grinding, her bite was bad and her teeth eroded from the gum recession, which caused noticeable receding gums. The “older lady” face comes from loosing facial support. 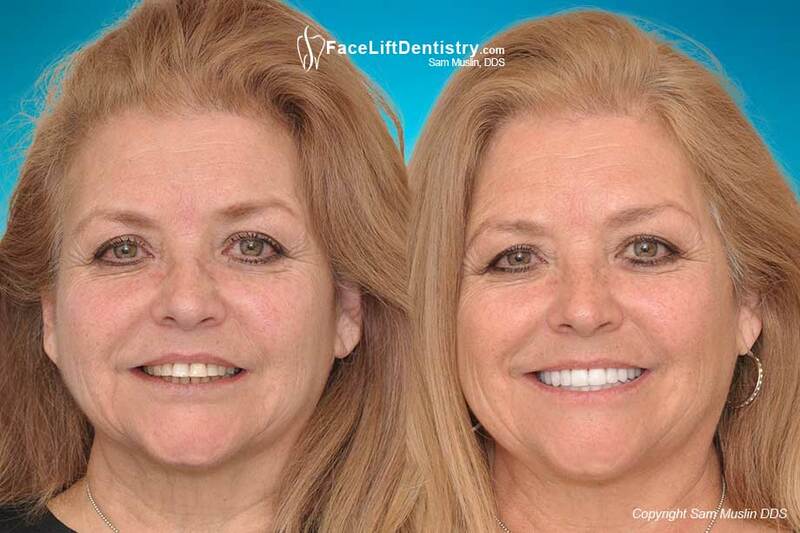 With a more sophisticated approach, the entire face can be revitalized with high tech dentistry. His entire face benefited by only working on his bad bite. 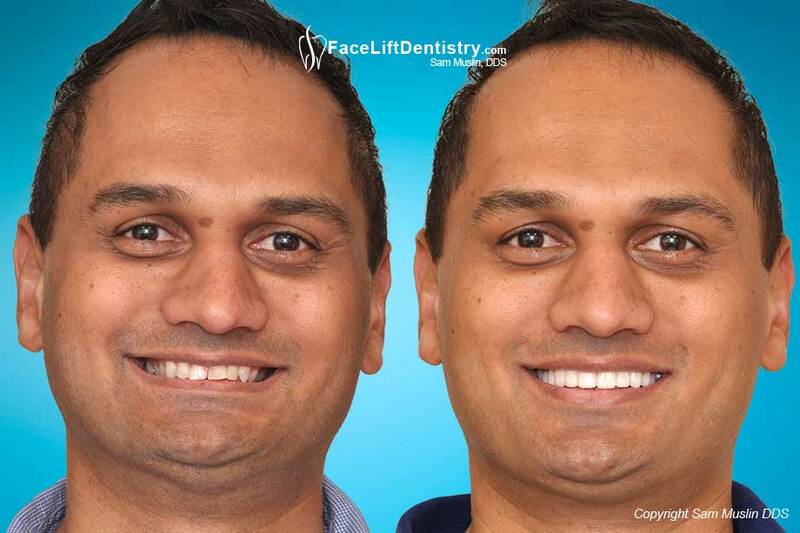 Root canals, teeth implants, porcelain crowns, porcelain veneers were all combined to improve overall health, develop the best bite, best tooth color and best tooth length for his dental health and face. 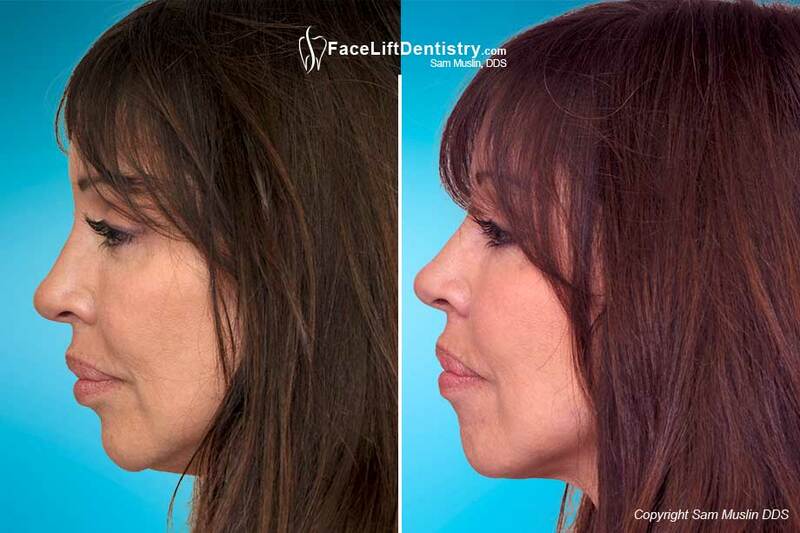 Eliminating a Deep Overbite with Face Lift Dentistry®, will also give the patient a healthy chin position that improves her facial profile. Overbites make the chins look smaller and the face shorter. 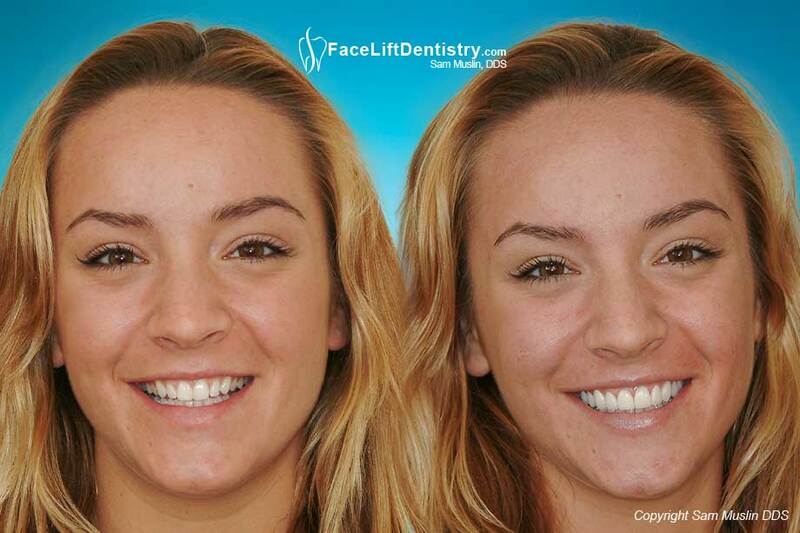 No braces using no prep VENLAY® restorations is the miracle of today’s high tech dentistry. 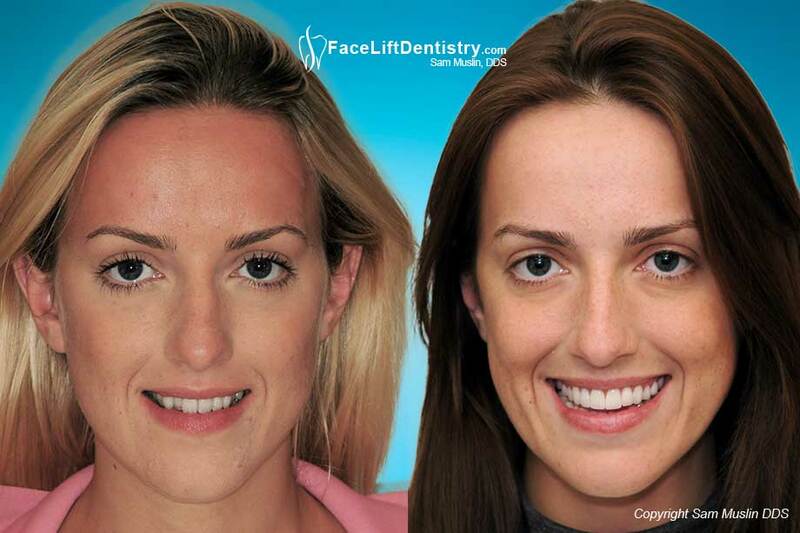 Dark Tetracycline-stained yellow teeth and old unmatched porcelain crowns were corrected with a custom teeth-whitening technique followed by replacement of her old porcelain crowns and porcelain veneers in just 2 visits. 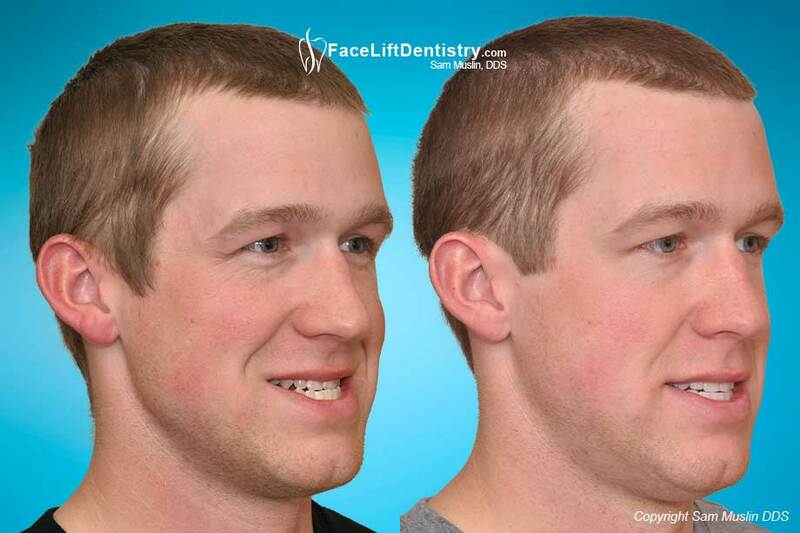 Neuromuscular Dentistry caused Neck Pain, Headaches, Difficulty Chewing, Jaw Pain, because of the method used. 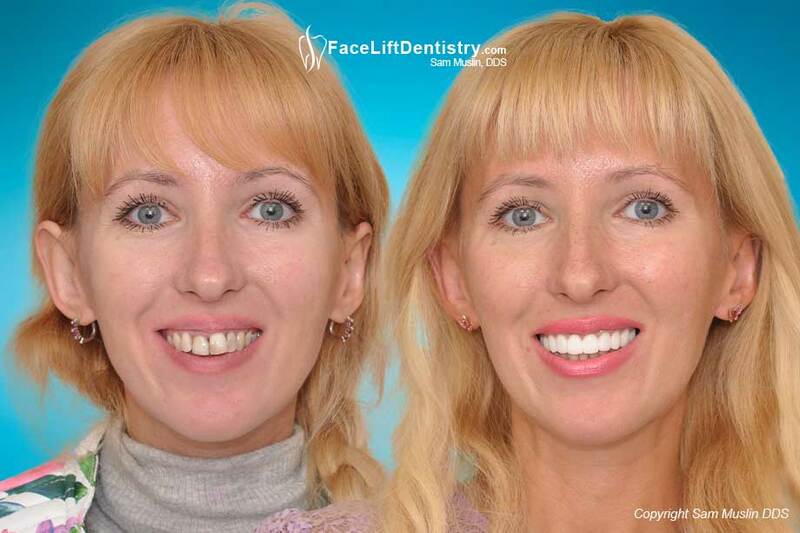 Her orthodontist, neuromuscular dentist and general dentist could not solve the problem. A dramatic reversal! 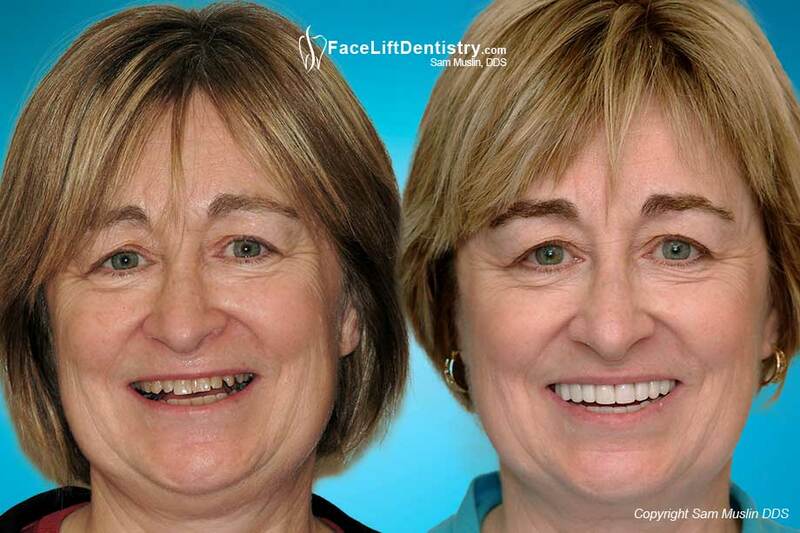 Bad cosmetic dentistry caused this patient to have a deep bite, worn down lower teeth and an older looking face. 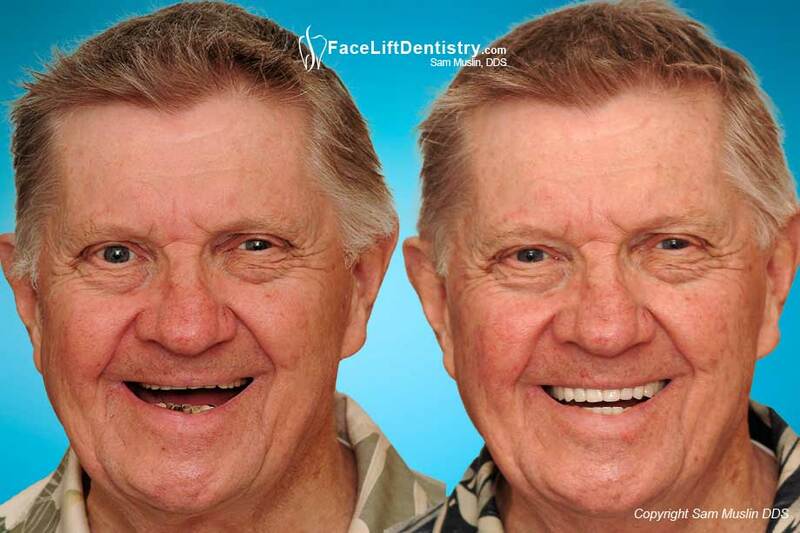 You could not see his upper teeth even if he tried to stretch his smile. Can You Tell? After already getting a lot of dental work, this patient traveled several hours in order to get her treatment done over by this dentist and she was not disappointed. 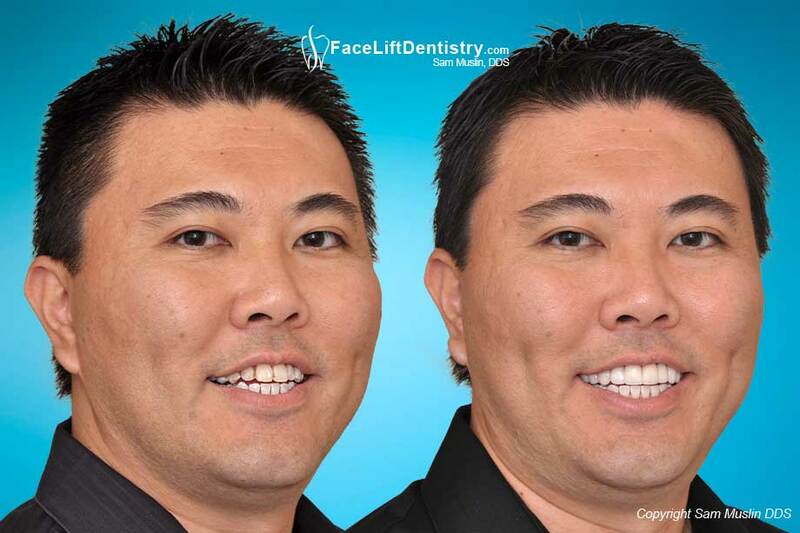 He heard about porcelain veneers and went to his dentist in Santa Barbara who wnated to grind down 6 healthy teeth for porcelain veneers. 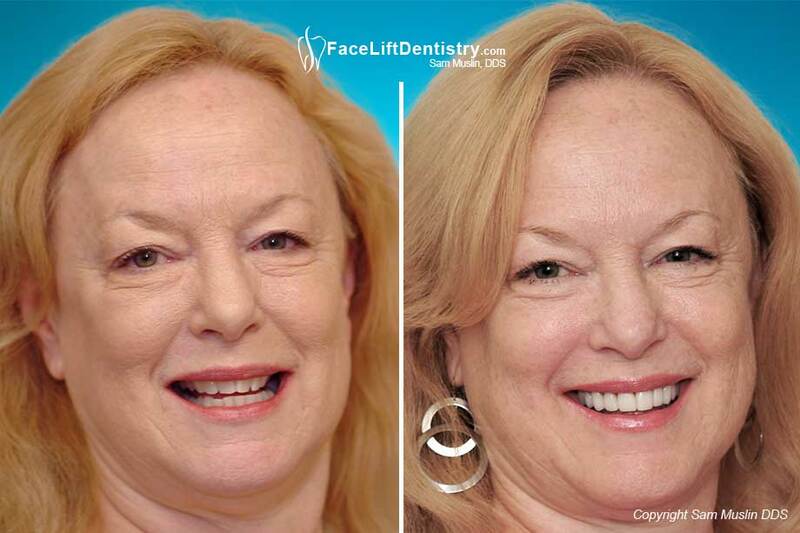 Dr. Muslin added veneers without any grinding down, not even a shot. Witness the remarkable outcome. 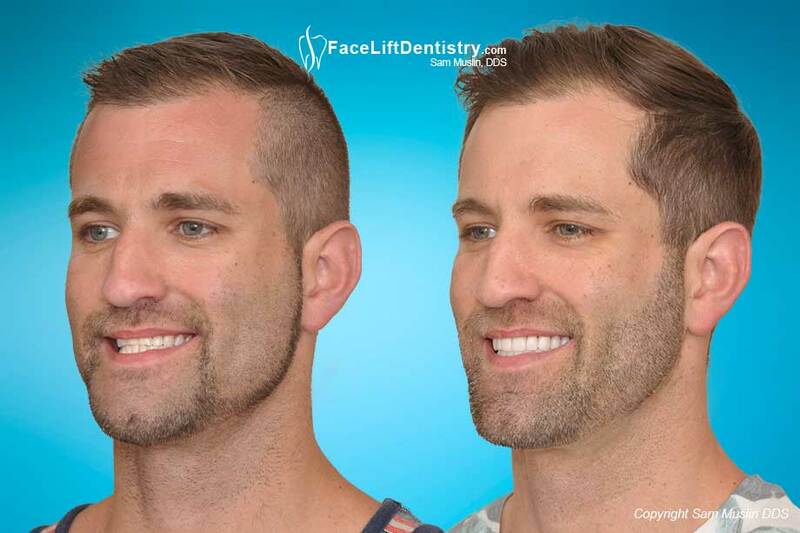 Fortunately there is a new option for those of us who suffer with receding gums and gum loss that requires no graphs, no sutures, and no incisions. This minimally invasive technique means less discomfort because there is no cutting and there are no stitches. 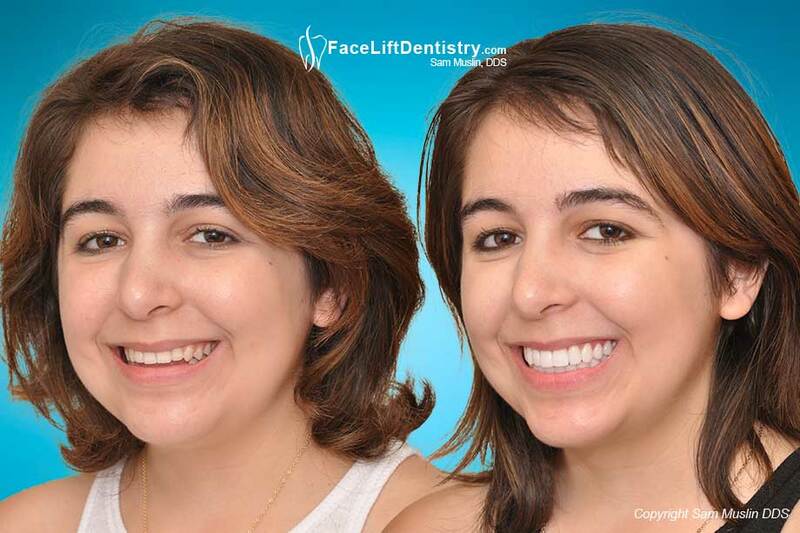 Fixed Porcelain Bridges, Gum Disease, Gum Infection, Tooth Extraction, Bone Graft, Dental Implant, Bite Reconstruction, Cosmetic Dentistry, Porcelain Crowns, Gum Disease. 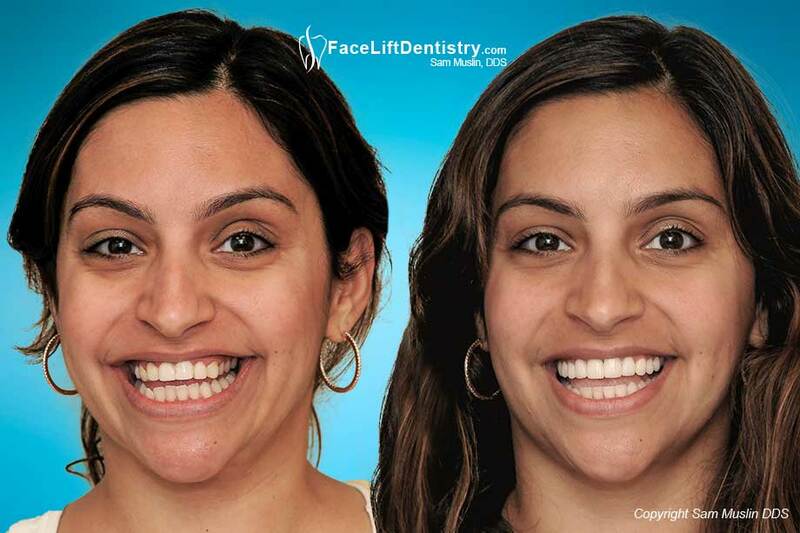 She traveled a long distance because she was not going to wear braces again. She now has straight white teeth in just a matter of weeks. 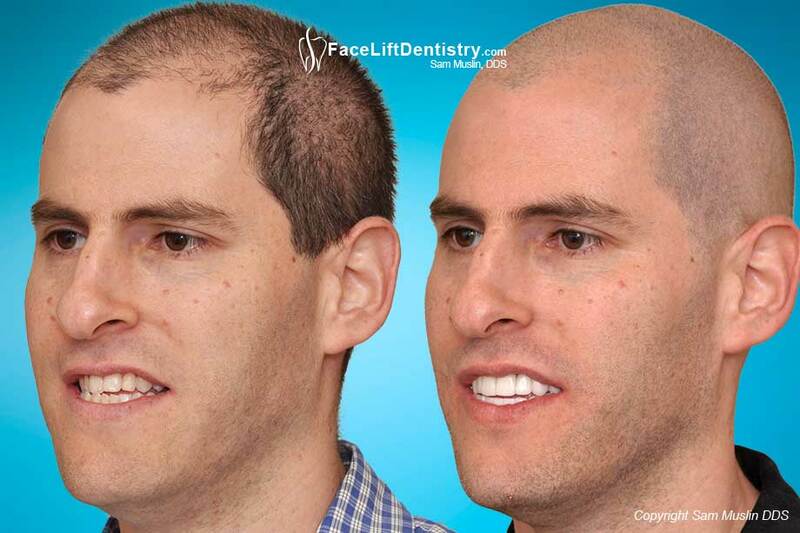 In the middle of his full mouth reconstruction treatment that was taking months to complete this patient lost faith and changed dentists. 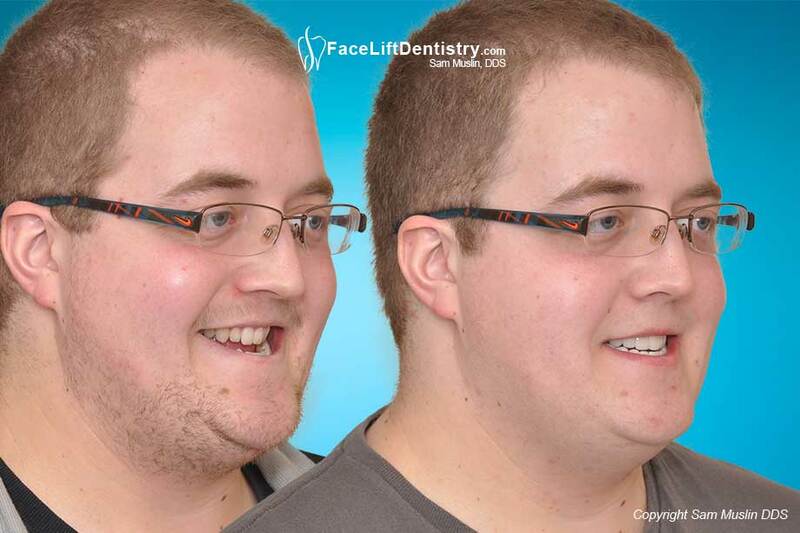 He had neck pain, tooth grinding and jaw issues that were resolved. 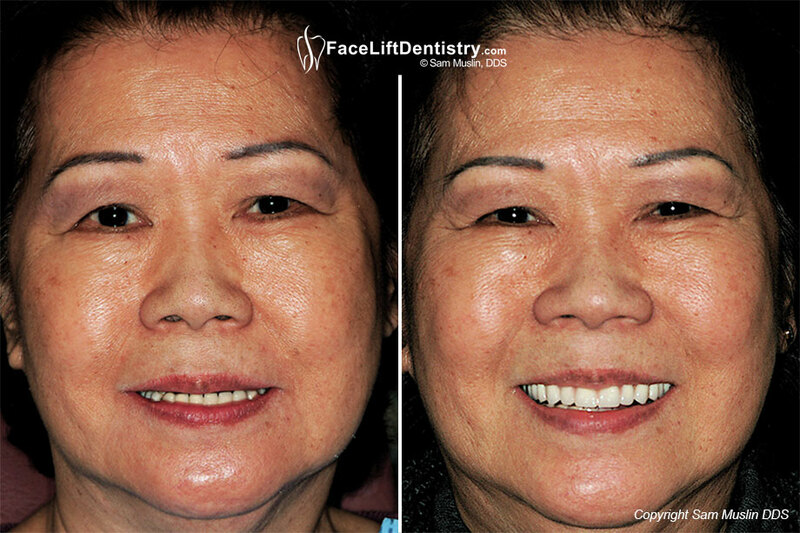 This patient flew in from another country in order to be treated by Dr. Sam Muslin because all he saw was bad porcelain veneers. 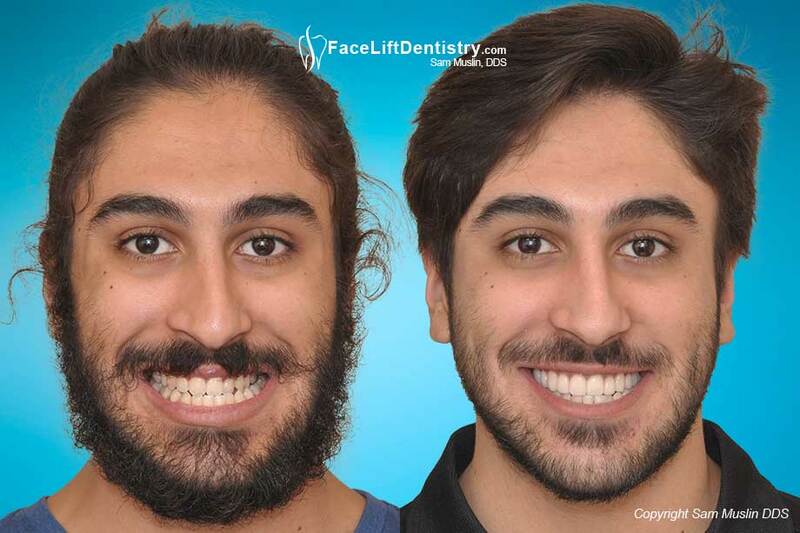 After viewing the “before and after photos” on this website, he decided that flying to Santa Monica California was worth it. 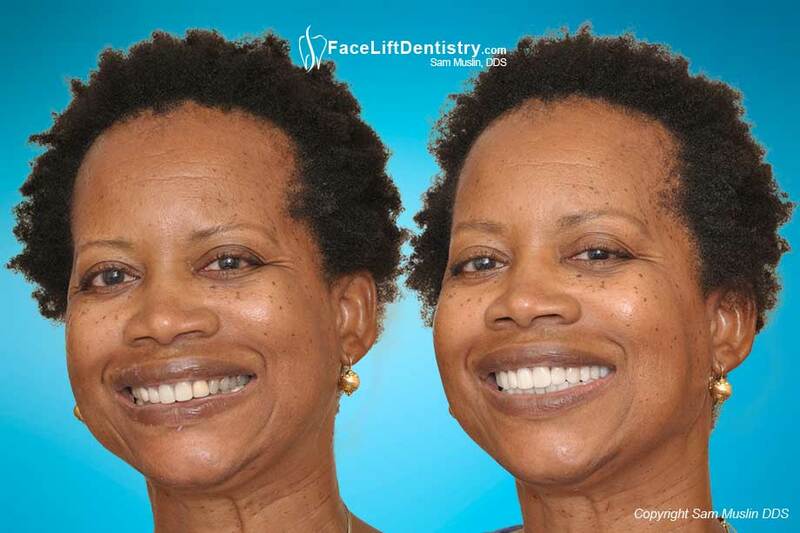 Bad bite, unnecessary root canals, unnecessary grinding down healthy teeth for porcelain crowns and the patient was in tears a year and a half later while explaining the problems to Dr. Muslin and she was still wearing temporary crowns. 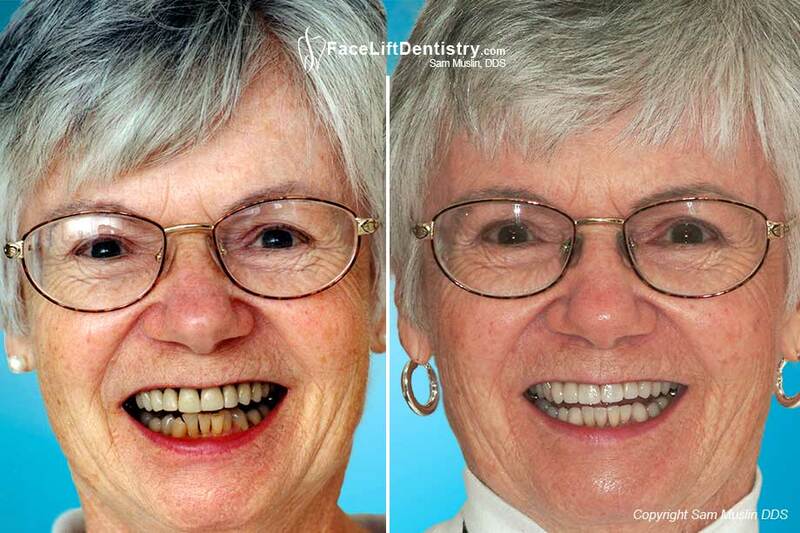 Prepless porcelain veneers were added to her front four teeth because the enamel was weak and wearing down. Weak tooth enamel can be strengthened and rough enamel can be smoothed when a porcelain veneer is bonded over the tooth enamel. The tooth sensitivity is completely gone. 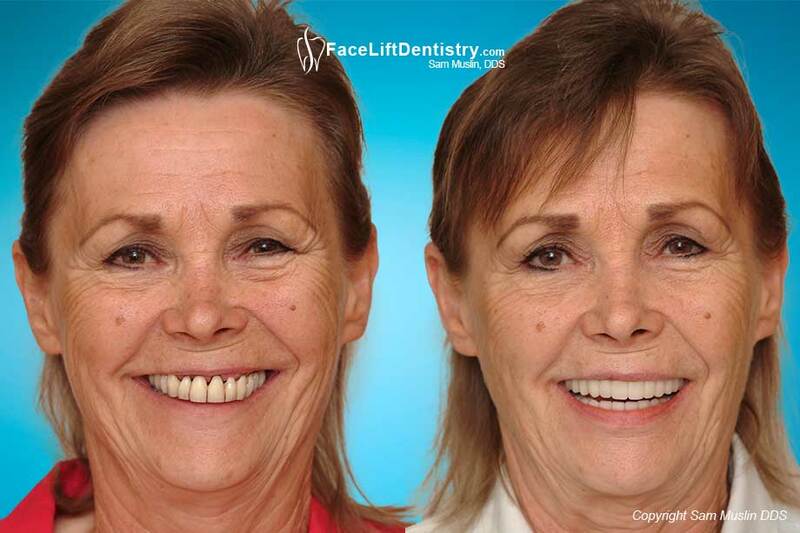 Once we pass 50 years of age, our teeth show the wear. They are yellow, short and worn. The old dental crowns are not color matched and the bite is getting worse. 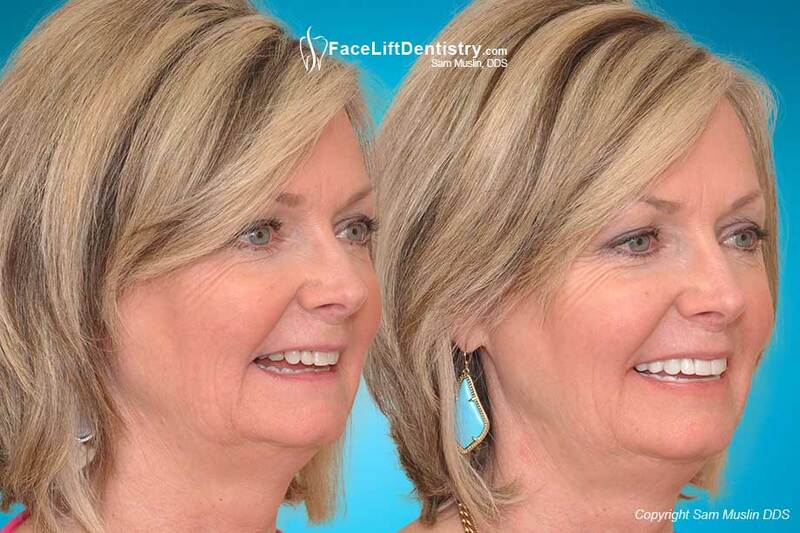 Face Lift Dentistry ® gives the patient the very best shape to their face within biological limits. 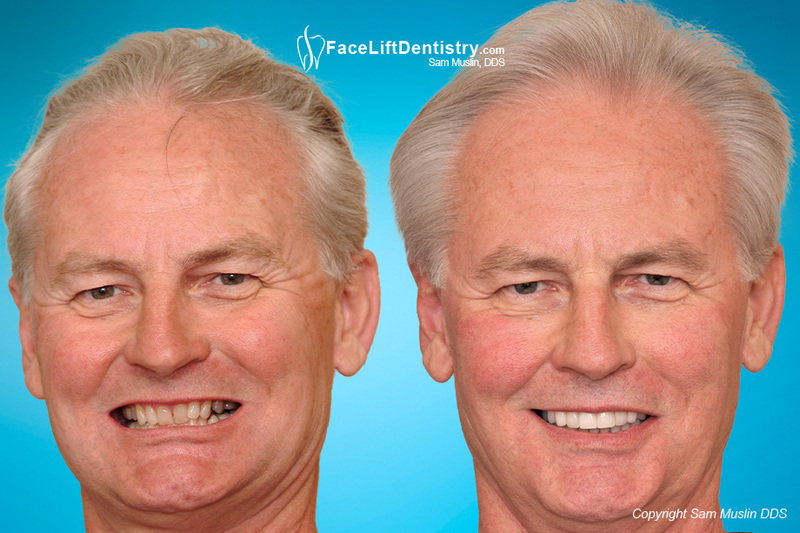 The aging process involves loosing facial support and wearing down your teeth. 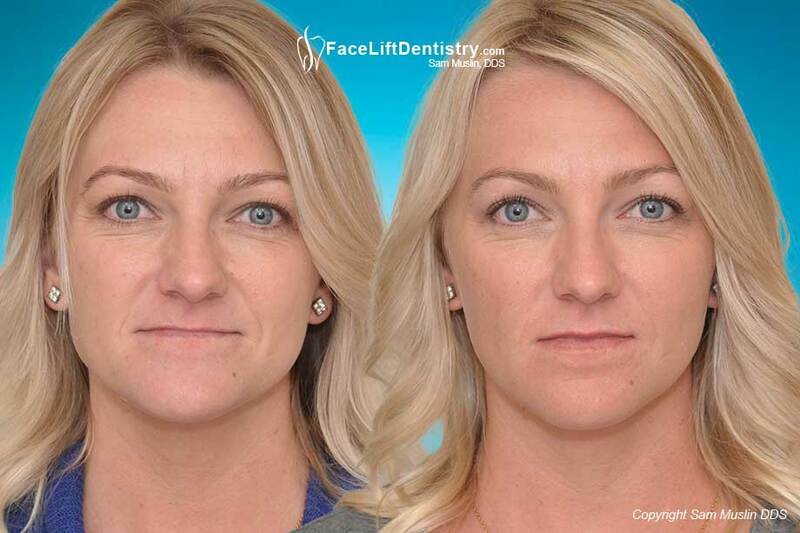 As the face gets shorter the patient looks older. 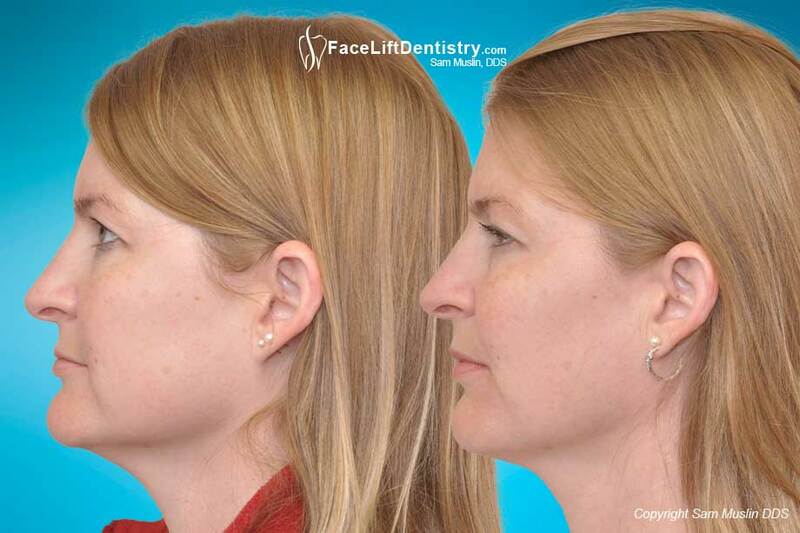 By idealizing the jaw position the patient looks years younger. 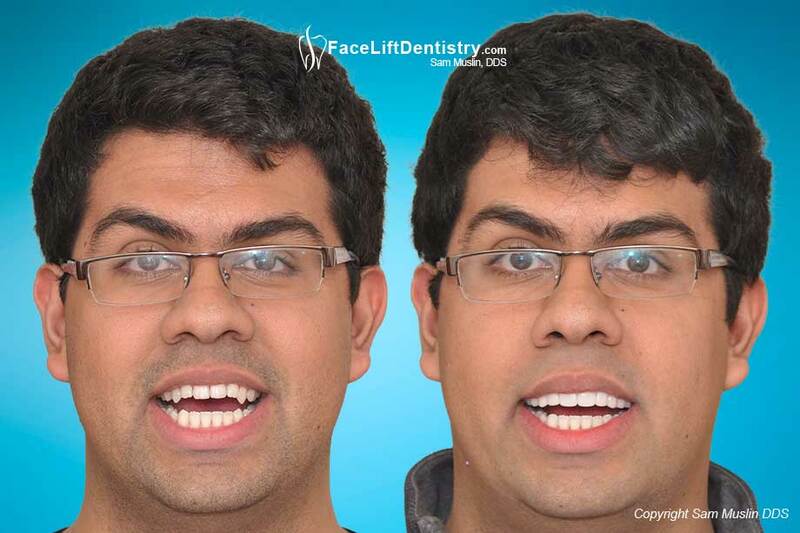 Also refered to as full mouth reconstruction dentistry. 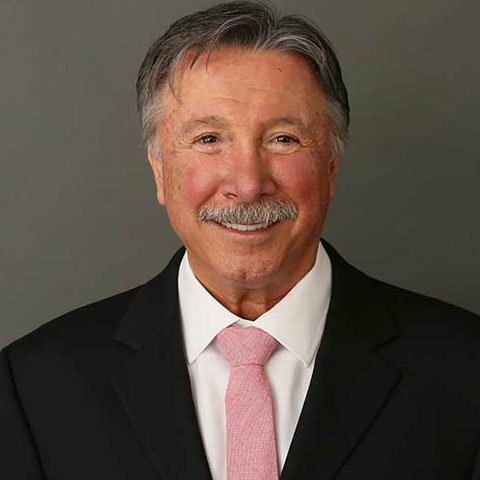 The definition of "bite correction" and the methods to achieve are not clearly defined so the treatment methods it are entirely different from one dentist to another. which is why it is not clearly defined. Her front crowns look fake, there was a space between her teeth called a diastema, her smile was narrow and her side teeth look short. 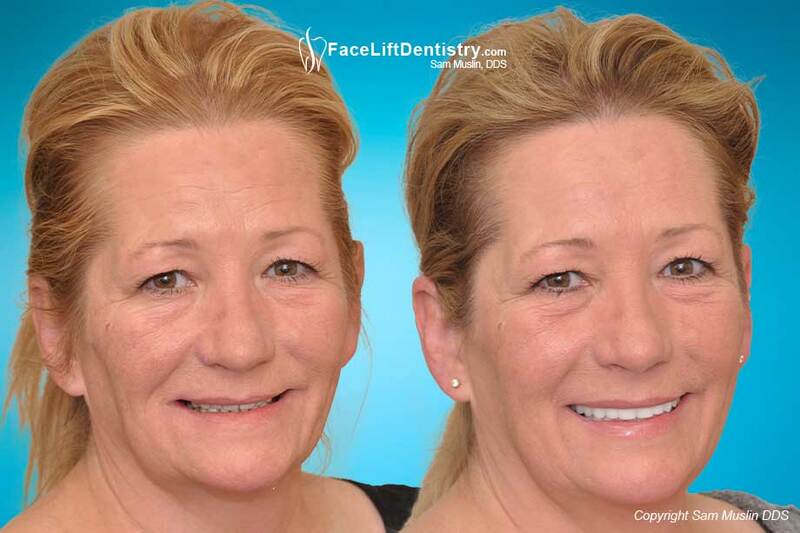 In just 2 visits, her smile was lifted, tooth extension surgery completed, crowns and veneers bonded and permanently whiter. 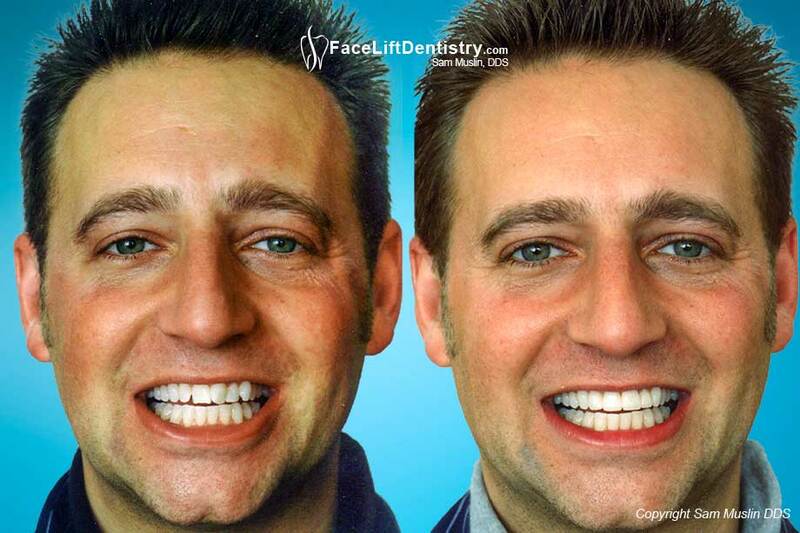 Dark tetracycline stains, gaps between teeth, and yellow teeth are completely resolved with no prep porcelain veneers to hide the dark tetracycline stain permanently. 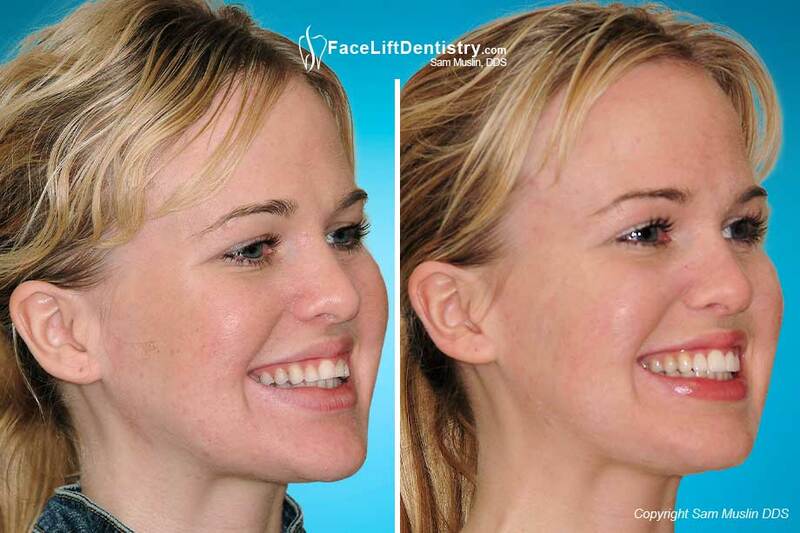 The shapes of her teeth and the length of her teeth were also improved for the perfect smile. Can’t See My Upper Teeth Anymore! 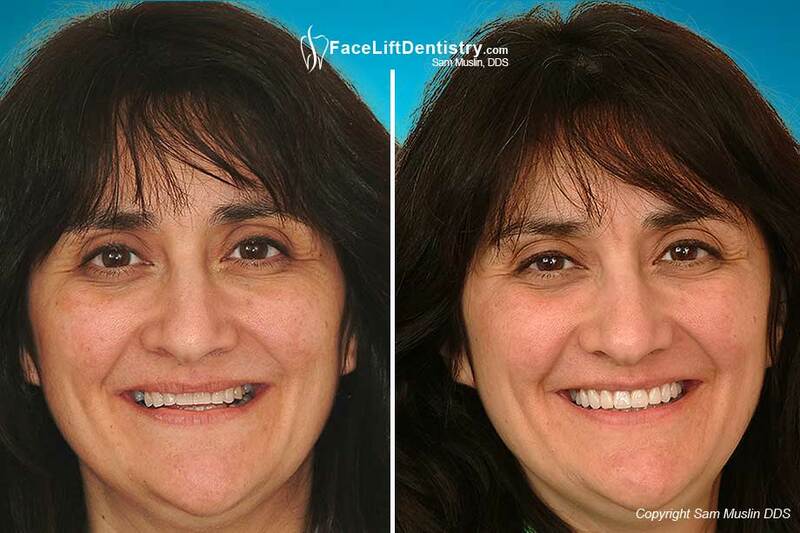 “No other dentist could help me so I traveled to see this dentist and I am thrilled.” This patient was treated in only two weeks. 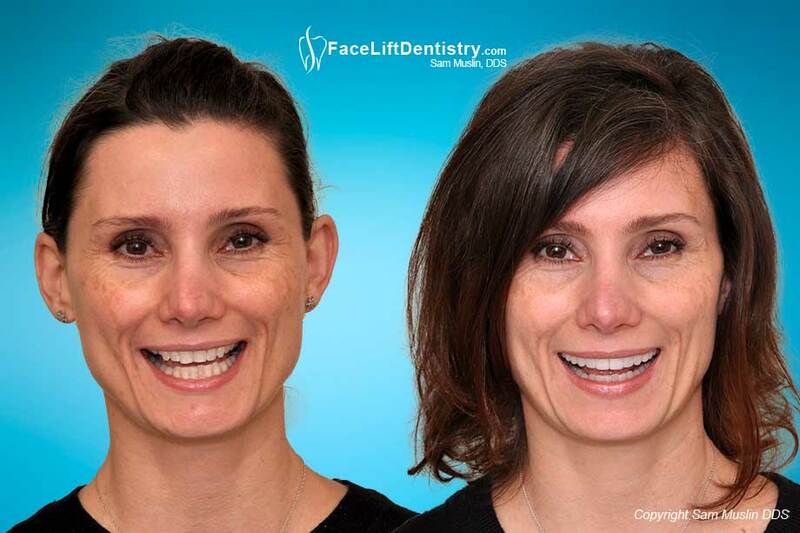 Facial pain, migraine headaches, TMJ pain and a deep overbite were all reduced with bite correction dentistry. 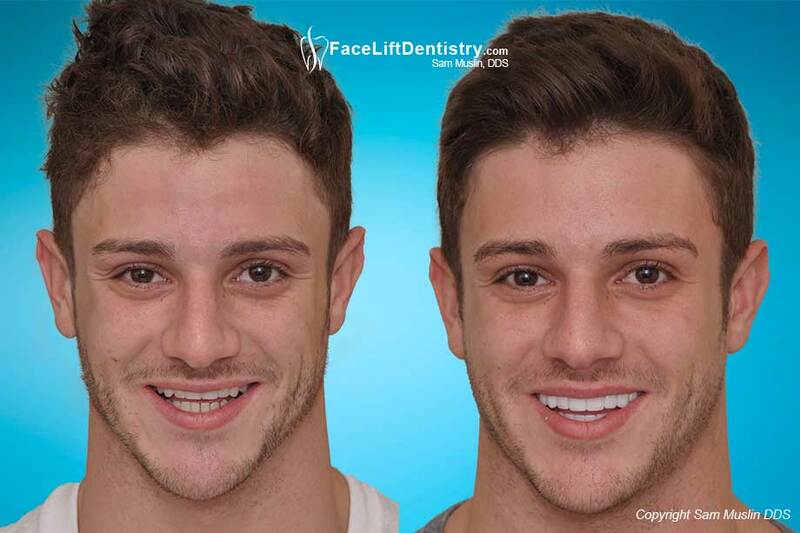 He has a smile lift or a lift in his bite along with longer and whiter teeth with porcelain crowns and no prep dental veneers. 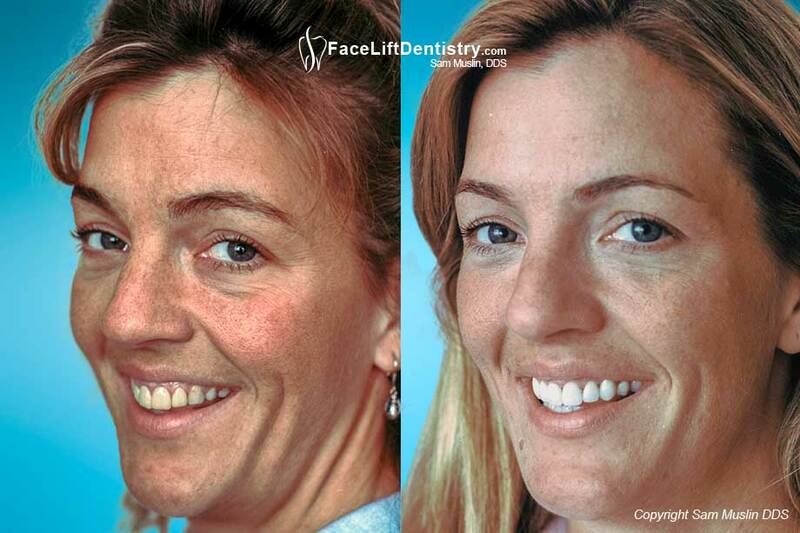 When the orthodontist extracts teeth to do the braces, most often the patient has premature aging. 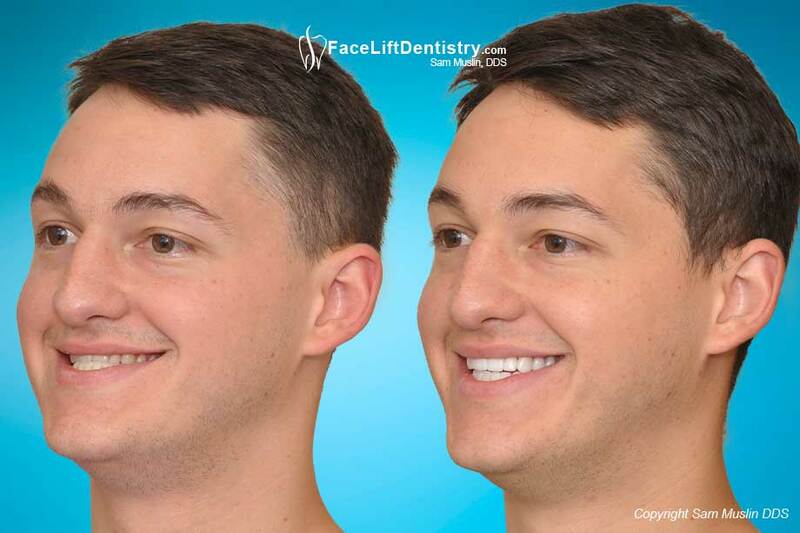 The face looses support because of the braces technique and all of the facial support can be restored. 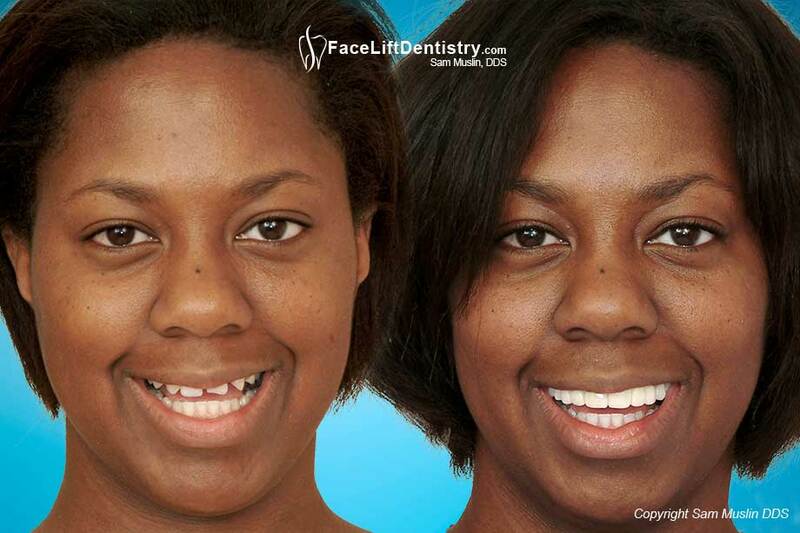 Dark tetracycline stained teeth were treated with porcelain veneers that required no grinding of her natural tooth structure. Crest whitening strips, Zoom II nor Brite Smile or any other chemical teeth whiteners cannot accomplish the same results as the non-invasive veneers. 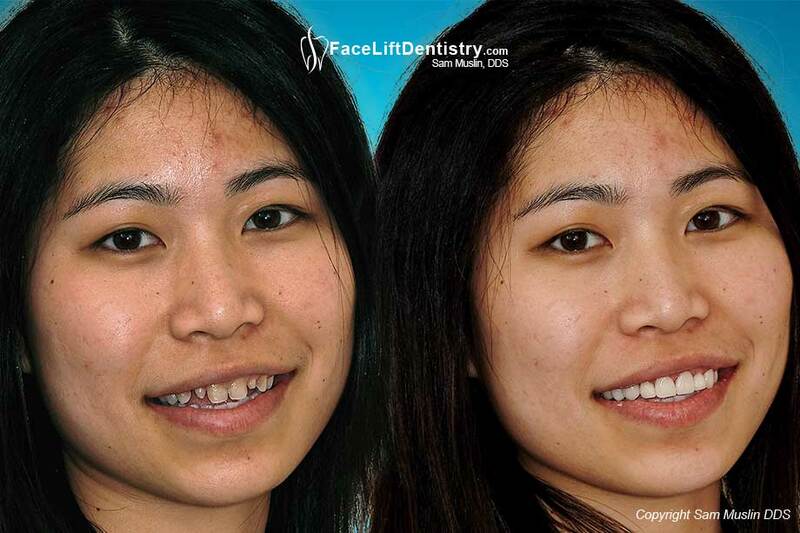 She wore braces in her past, had teeth removed, has a narrow smile and crooked teeth. 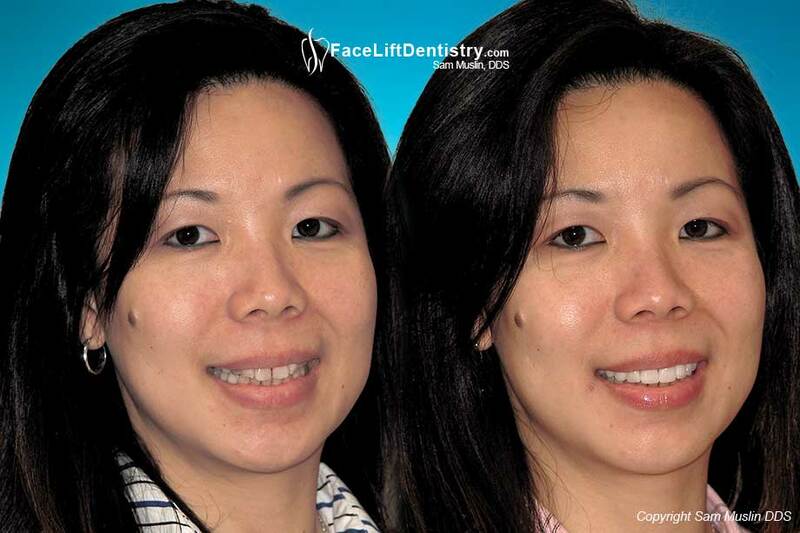 She flew in from Monaco because her friends and her dentist advised her to not get porcelain veneers. She researched Dr. Sam Muslin online and felt that flying from Europe was worth the trip. 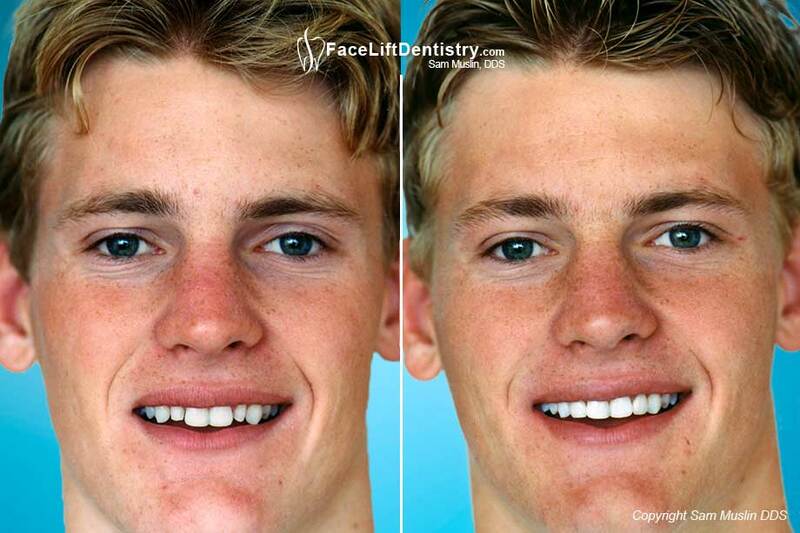 Porcelain veneers that required no drill or teeth grinding were used to make crooked teeth look straight and to permanently whiten his teeth. 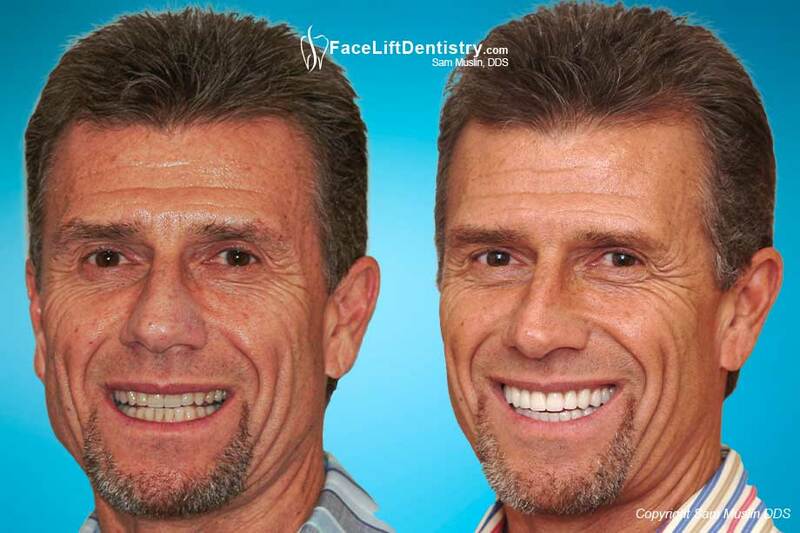 His extreme fear of dental work and refusing to do teeth bleaching forever, made dental veneers the best choice. Root canal treatment, replacement of old amalgam fillings, and old gold crowns were completed in just two visits per dental arch. 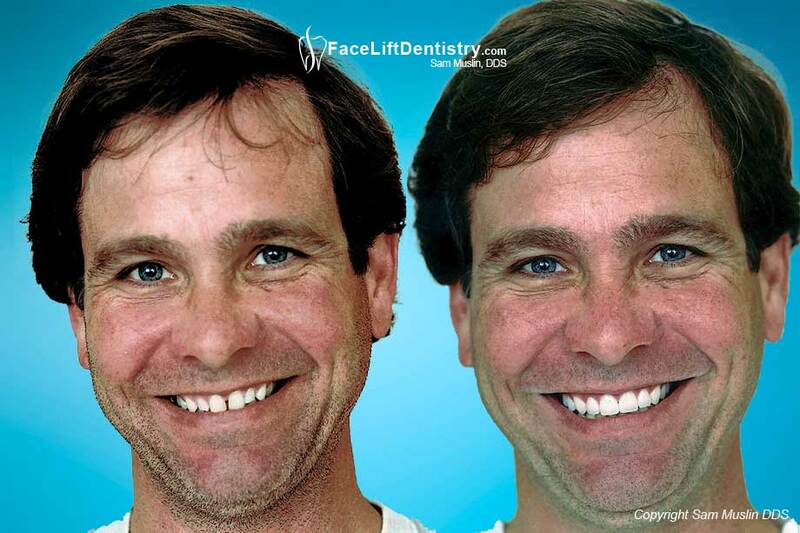 His entire bite was reconstructed, thus reducing the gum recession, gum infection and improving overall health. Sometimes, Dad needs to step up his game. He doesn't realize the image that he is projecting. 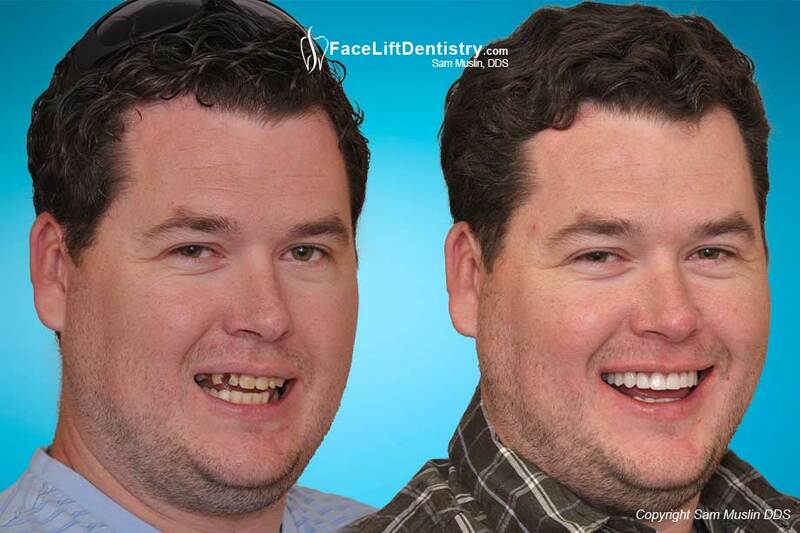 He has looked at himself with bad teeth for so long, he thinks it’s normal. 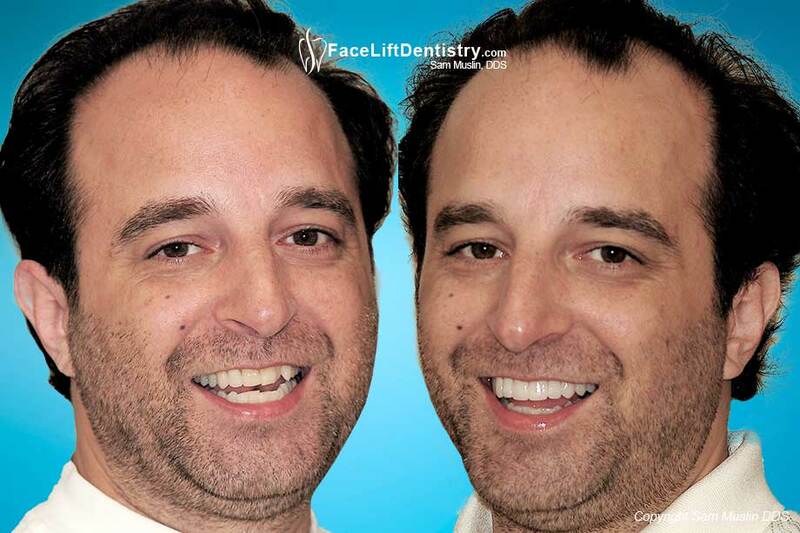 After seeing Dr. Muslin on TV, he knew he found the best dentist. 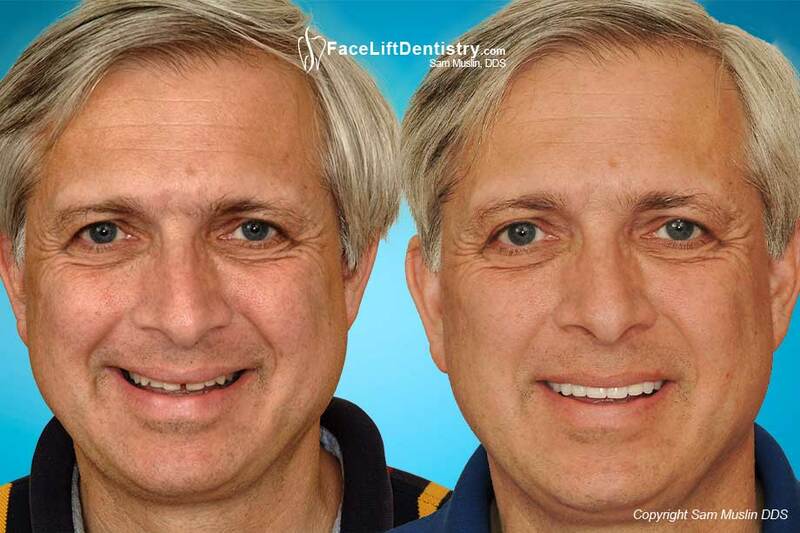 Eliminating a Deep Overbite, Replacing Fake Looking Veneers, Removing Bad Veneers, Replacing Fake Looking Crowns, Eliminating Black Lines at the Gum, The Dental Face Lift, Looking 10 years Younger, Natural Looking Porcelain Veneers and Crowns. 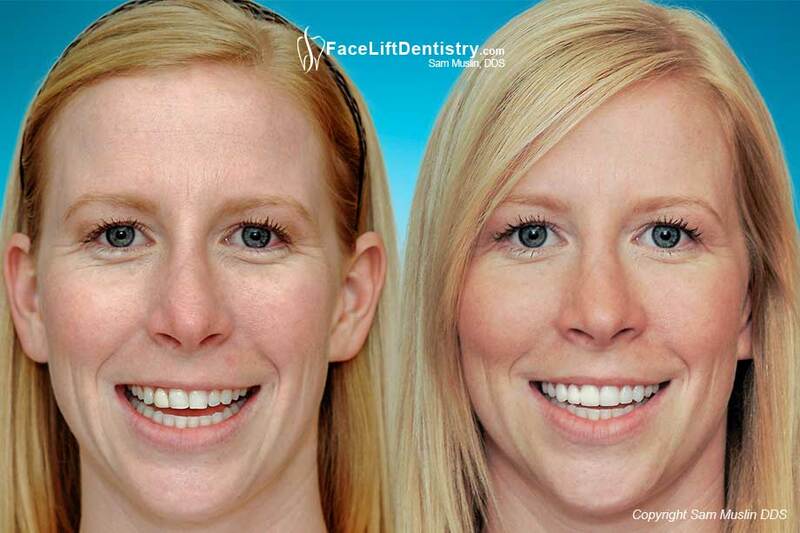 She already has a good smile but she wanted to light up the room with a whiter and a wider smile. 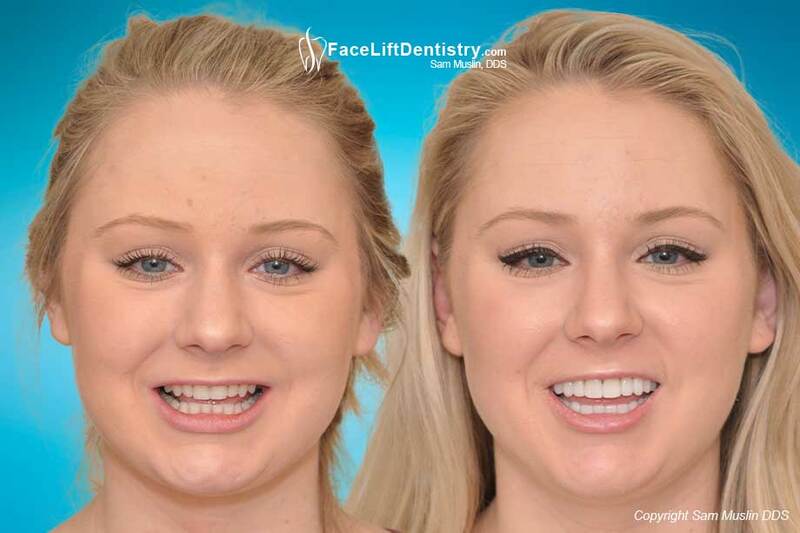 Her teeth were lengthened, strengthened, whitened and her smile widened with non invasive, no tooth grinding porcelain veneers on her upper 10 teeth. 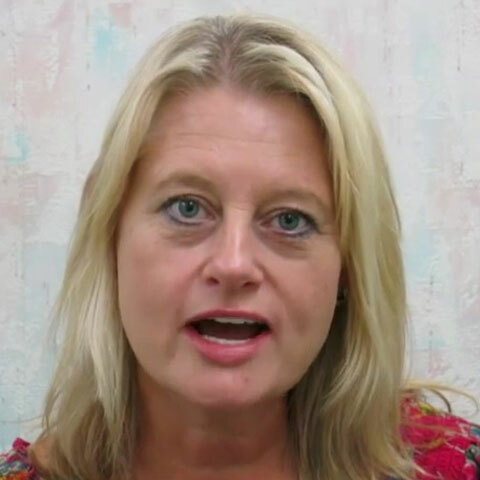 Crooked and stained lower teeth show when the patient is talking. Most of us look in the mirror and smile, next time look in the mirror and just talk. You will see your lower teeth just like the rest of us see them. 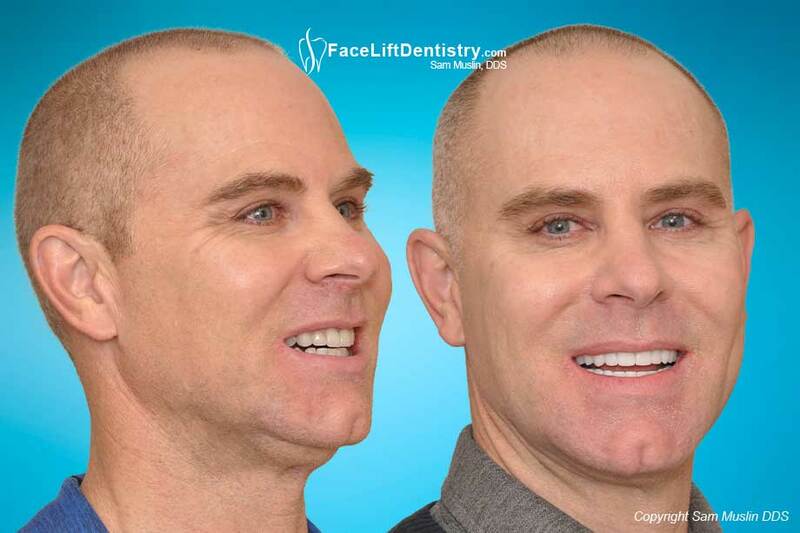 High Tech treatment is now available to actually correct the underbite without surgery in a matter of weeks. This is not just cosmetic camouflage; it is an actual underbite correction. 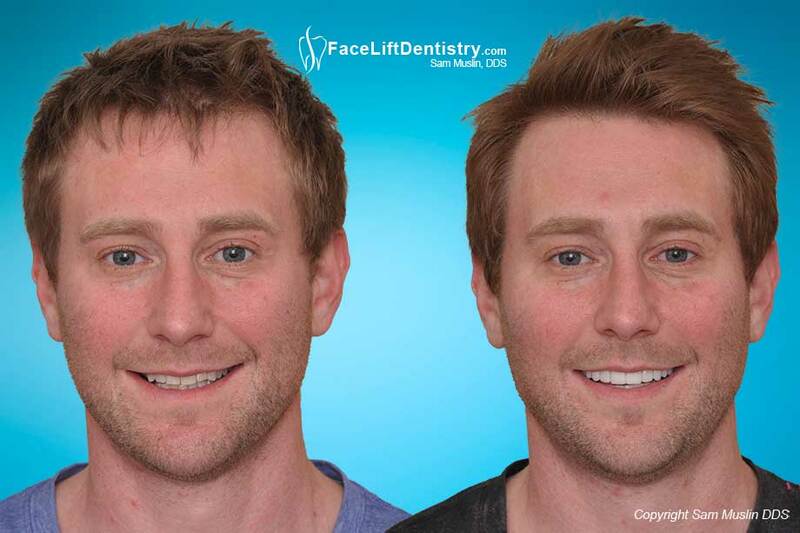 Instead of wearing braces for years, he had his crooked teeth look straight in only 2 weeks with minimal tooth grinding porcelain veneers. Only 4 teeth were treated. 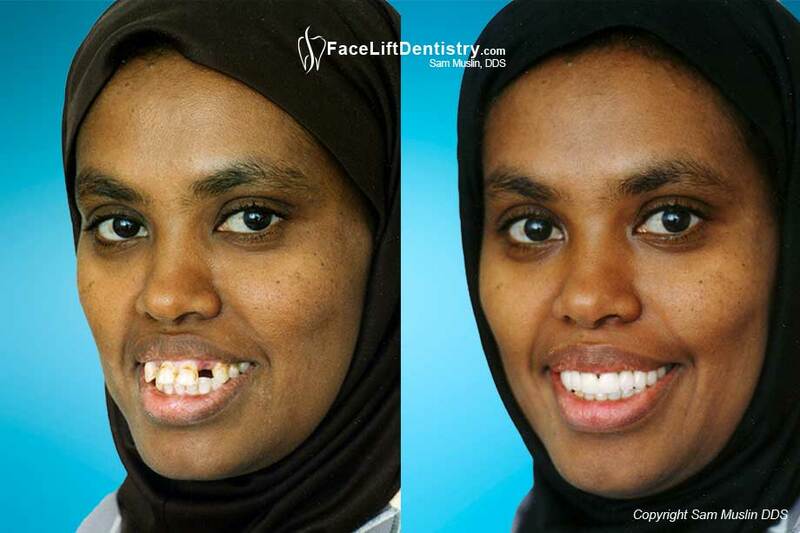 All other teeth had Dr. Muslin's custom teeth whitening. Two teeth were too small and out of proportion. 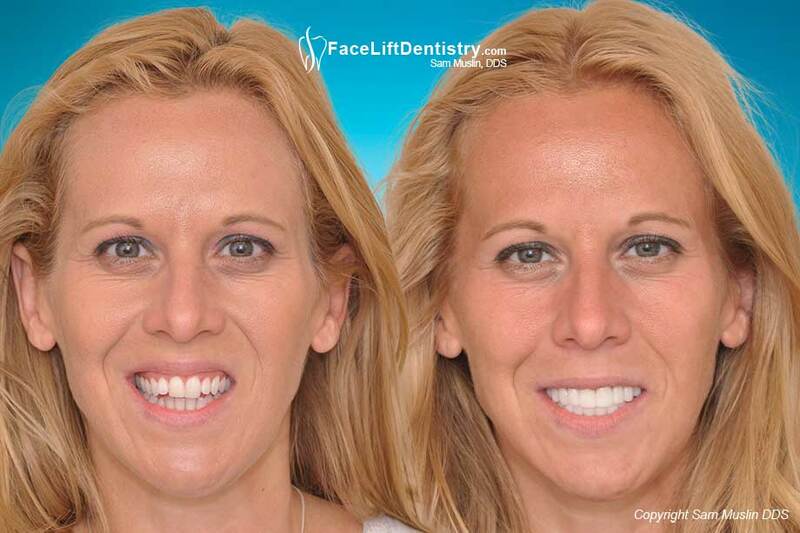 They were treated with porcelain veneers. 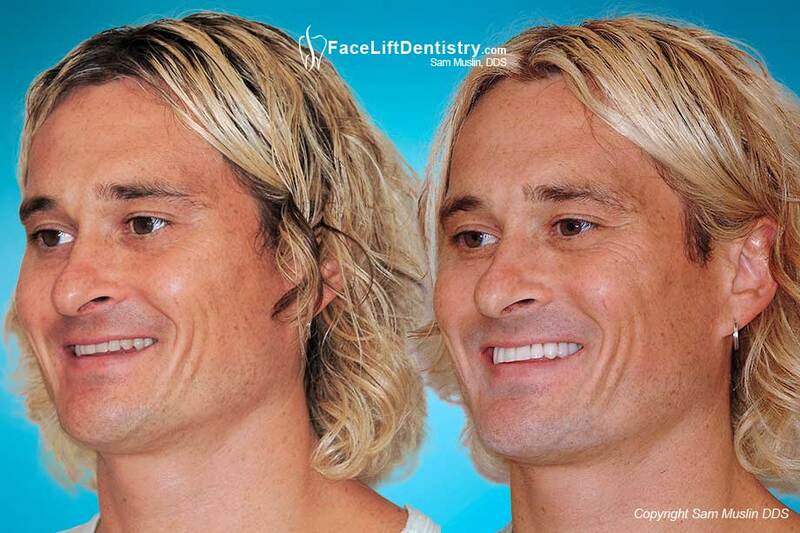 Prior to doing veneers, all of his teeth were whitened with a customized teeth-whitening system. 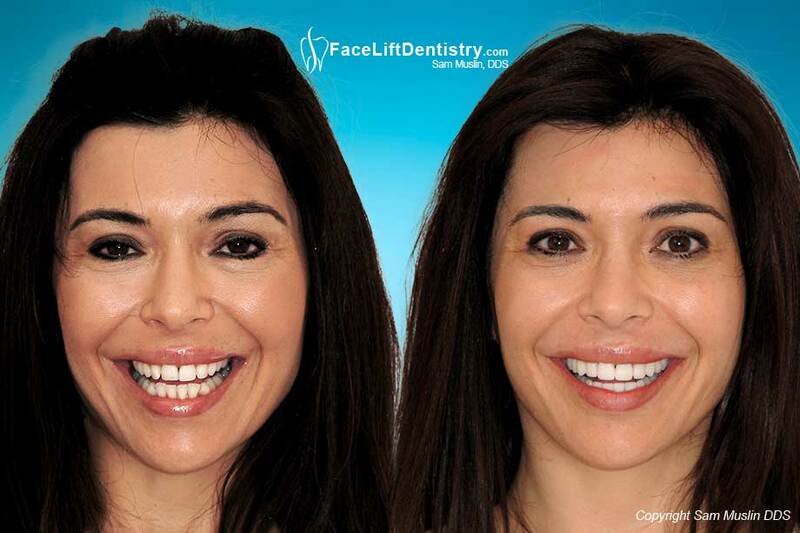 If the patient only wants to work on the front two teeth, cosmetic bonding would be my first choice and if the patient wants to work on more teeth then painless dentistry involving non-invasive, no-prep porcelain veneers would be the best choice. 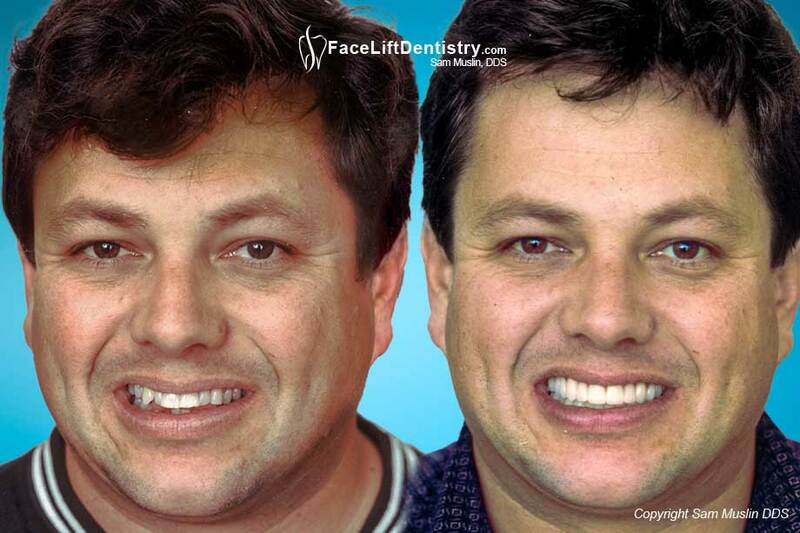 This patient has one “baby tooth” that was restored with his porcelain veneers. The treatment has been successful for nearly 20 years. 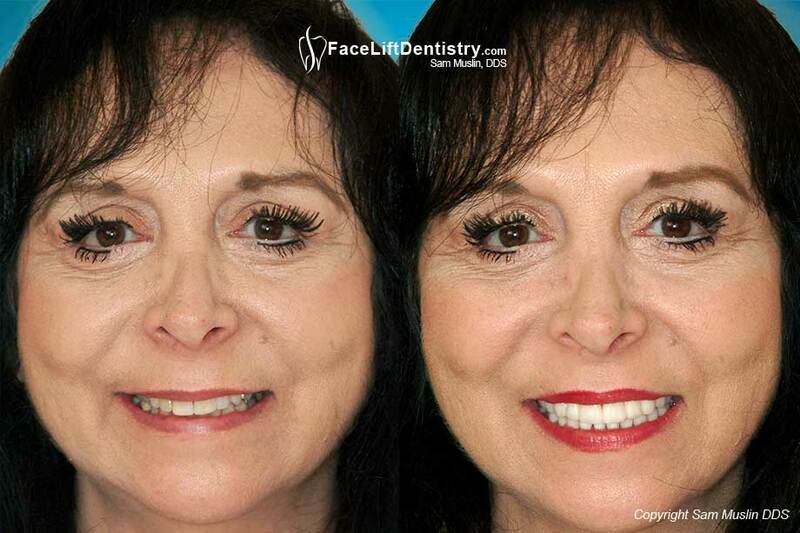 Porcelain Crowns with black lines at the gums, were replaced with perfect fitting porcelain crowns. When the fit is perfect, the gums can grow back naturally. Spaces between the teeth, an old dental bridge with black lines at the gum line and old dental crowns were all replaced in 2 visits. Her smile looks perfect because of the tooth size proportioning. After 5 years of braces he still had a deep over-bite and spaces between his teeth. 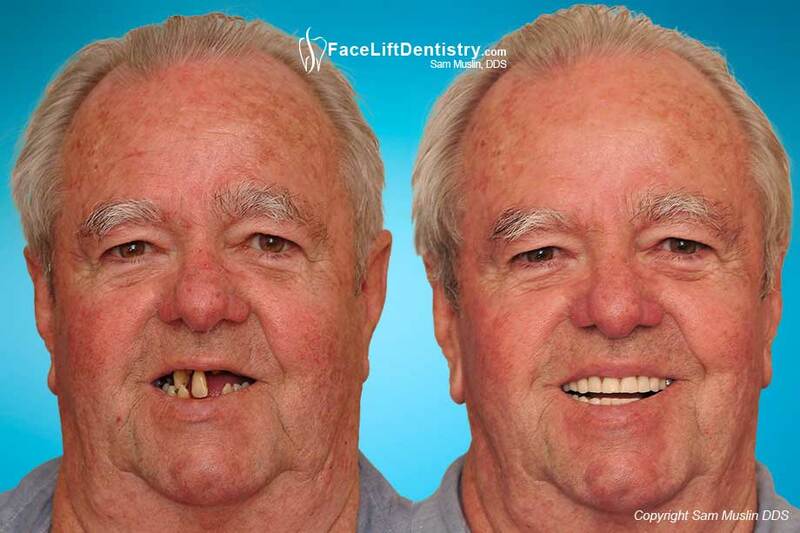 Using no tooth grinding VENLAYS®, his deep bite was corrected in two visits. 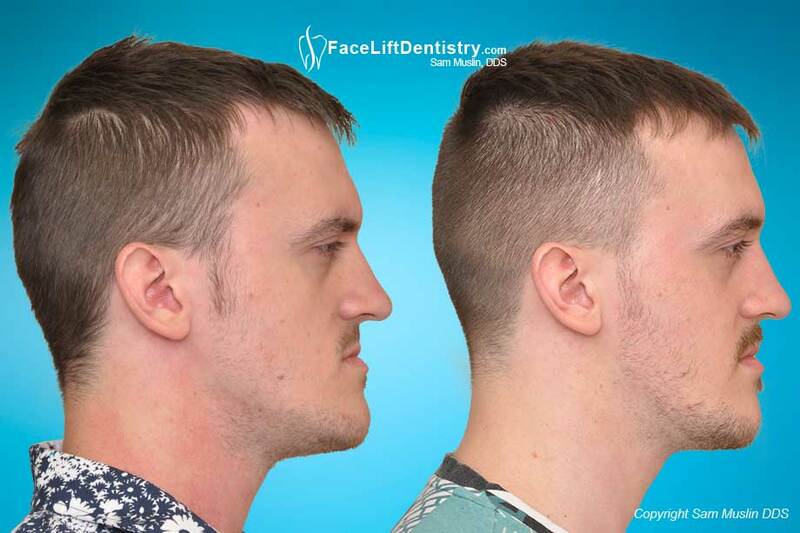 His face was lengthened and his lower jaw was repositioned non-surgically to get the masculine looking chin. Bad Porcelain crowns cause gum recession. 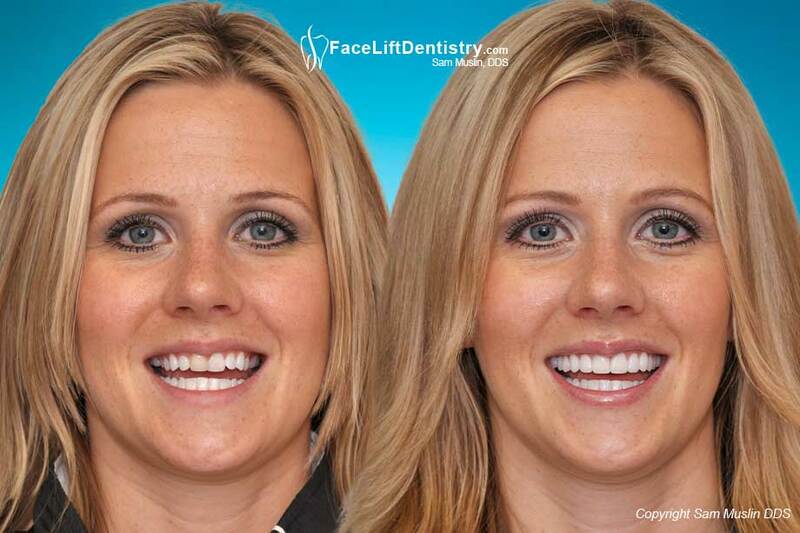 Perfect porcelain crowns that seal exactly to the tooth help the gums grow back for the perfect smile. 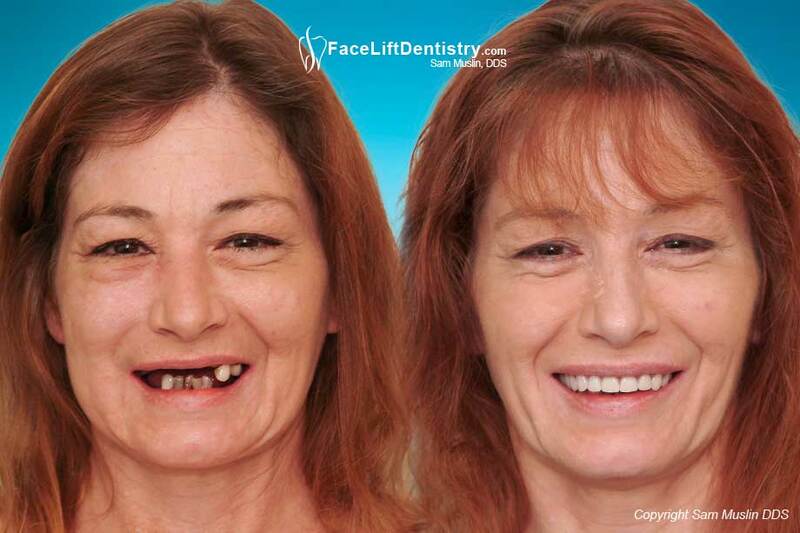 Some patients hate their big fake looking teeth. They stick out too far and the old porcelain veneers look thick and bulky. She had everything replaced and her bite corrected. Treatment was over 15 years ago and still going strong. A deep overbite made his lower jaw look small. 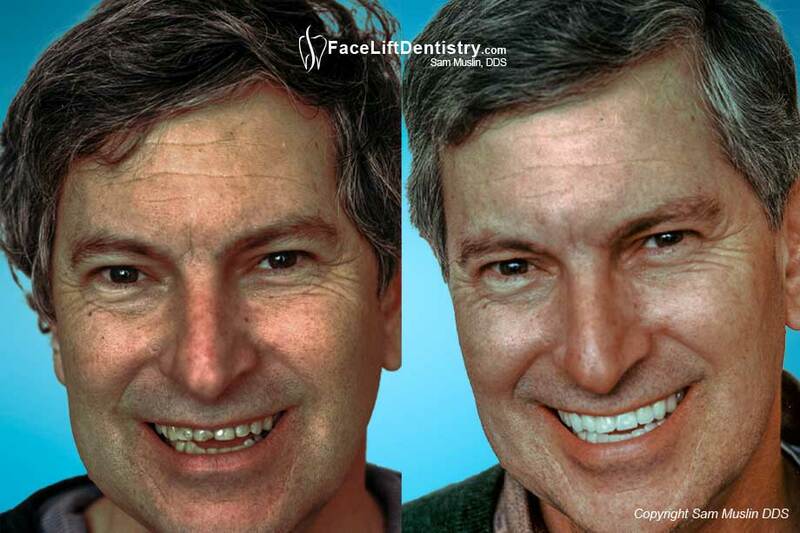 By only working on the teeth, his overbite was corrected and his chin looks much larger. His facial profile and smile are permanently improved. 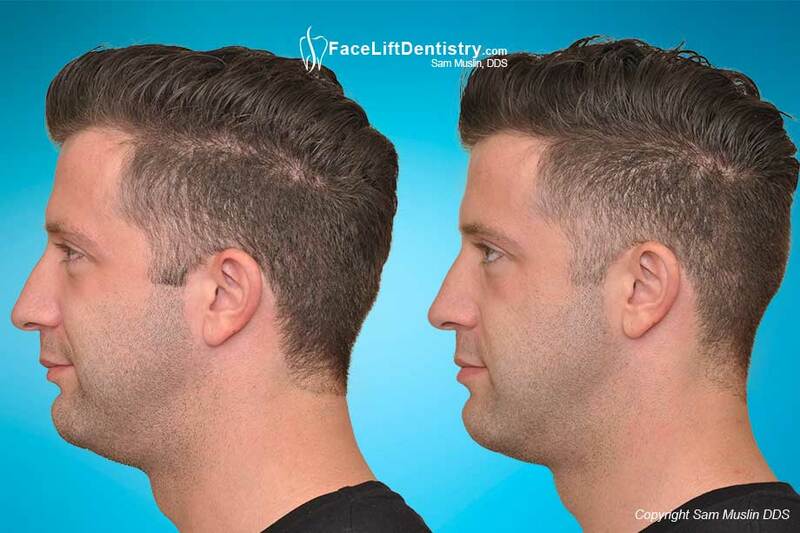 No TMJ Surgery, No Jaw Surgery. 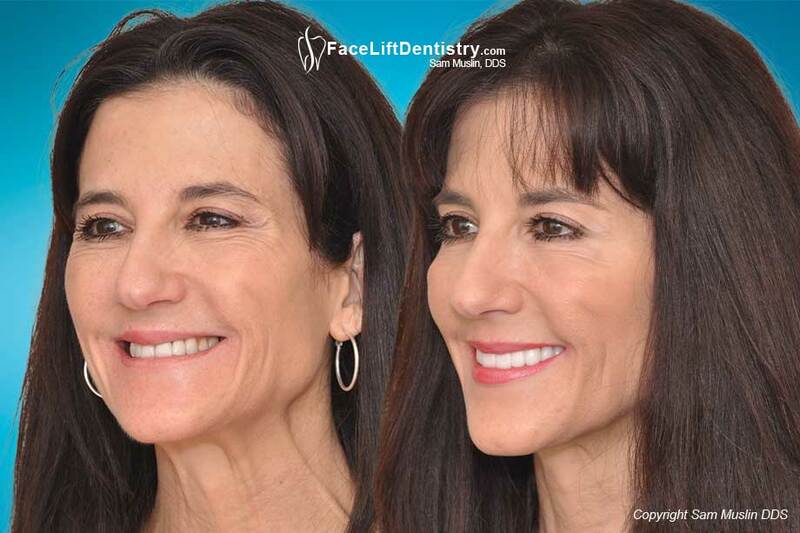 A collapsing bite with teeth spreading apart required Face Lift Dentistry®. 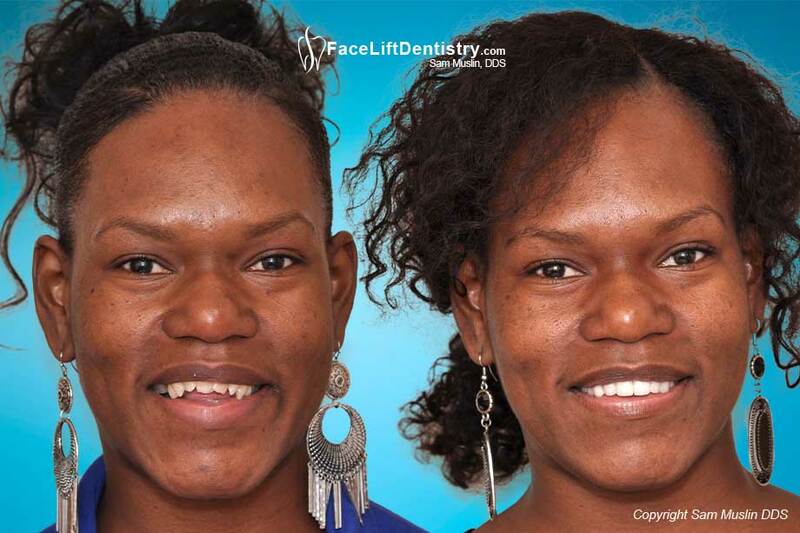 Dental implants, porcelain crowns, Procera crowns and a fixed porcelain bridge were utilized to completely rebuild her bite. Her lip is now less prominent and the gum disease is controlled. 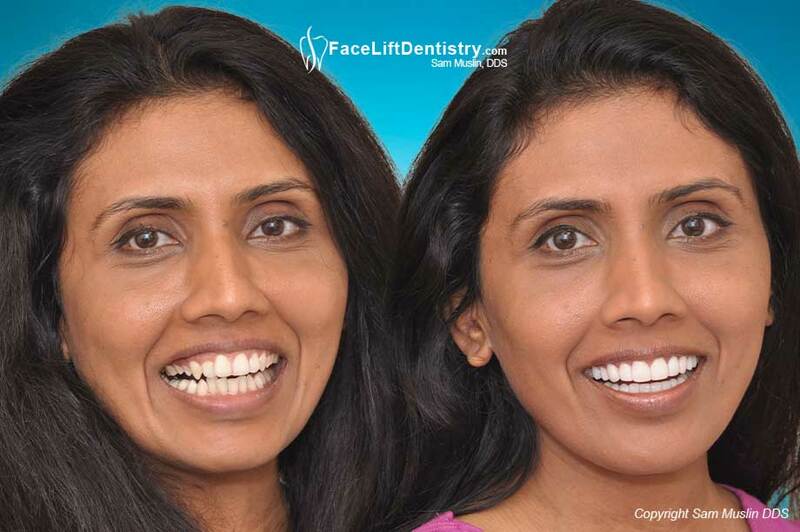 The perfect smile must have perfect gums and tooth size proportioning. Her front teeth were too big and were not sealed to the teeth. The gums were infected. 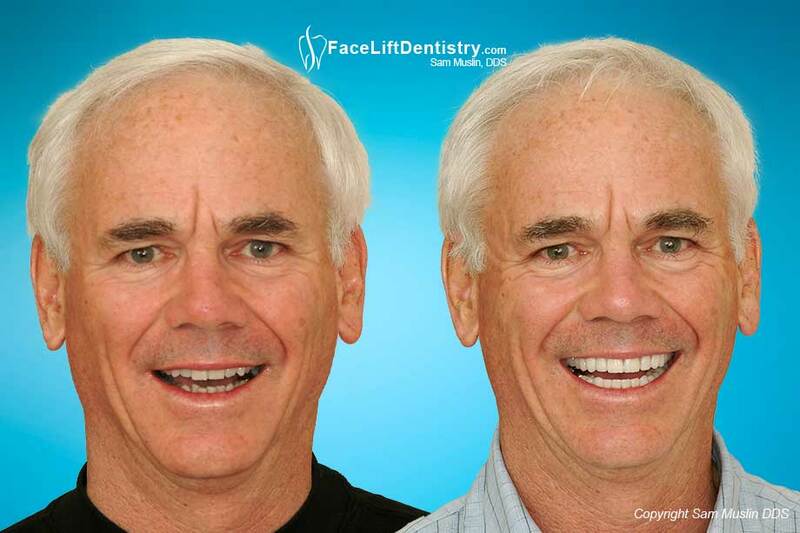 But once crowns were done that sealed perfectly, the gums grew back. 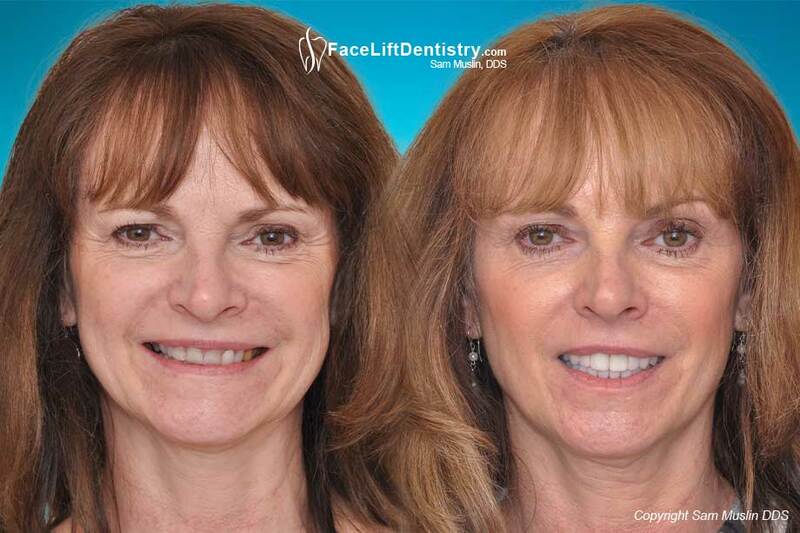 Need to learn more about a non-surgical facelift?